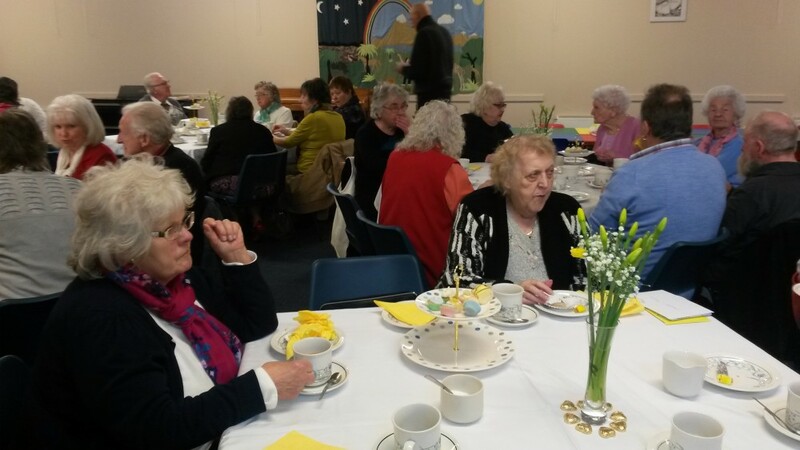 At important times of the Christian year we invite senior citizens living in the parish and local area to join us for a tea party. 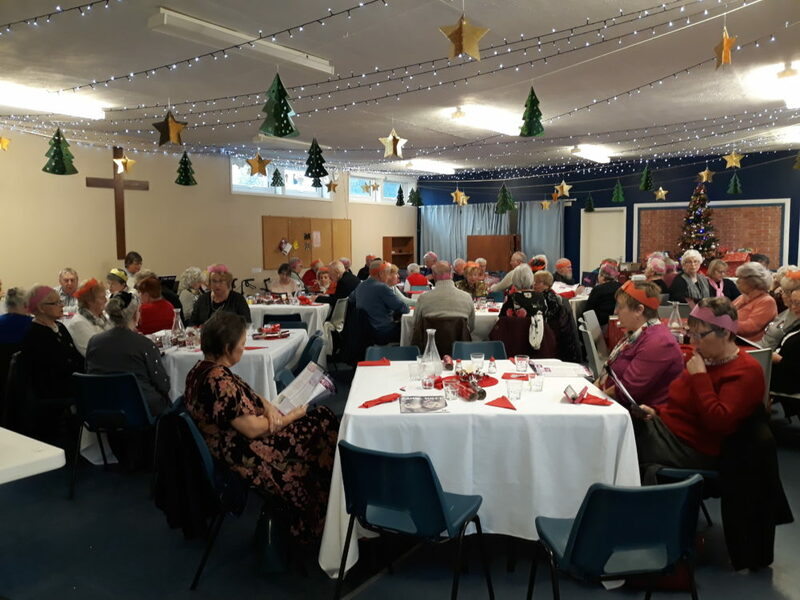 This is a wonderful occasion when members of the church come along to decorate the church hall, prepare and serve food, provide music and singing and share a seasonal message. 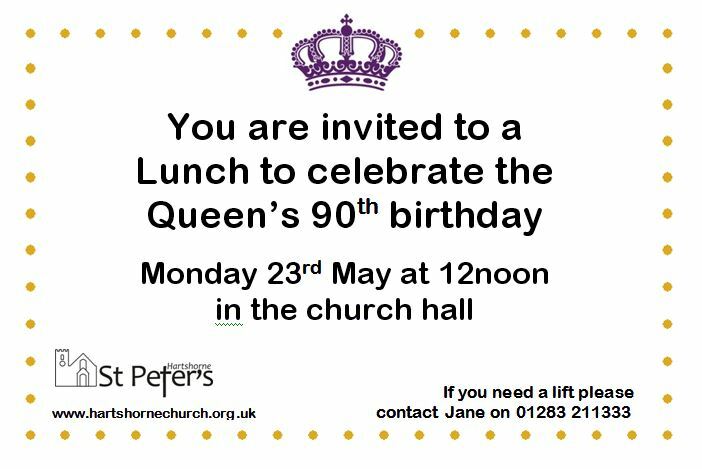 We provide transport if requested. 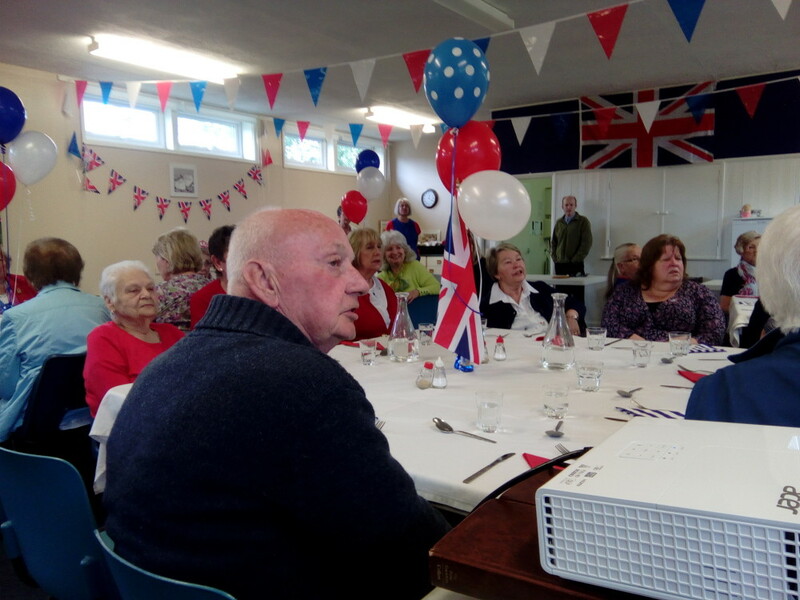 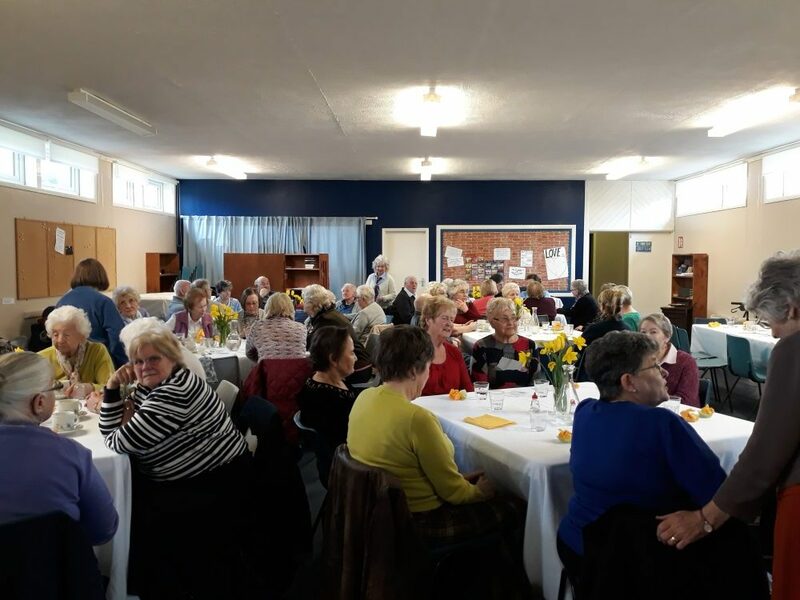 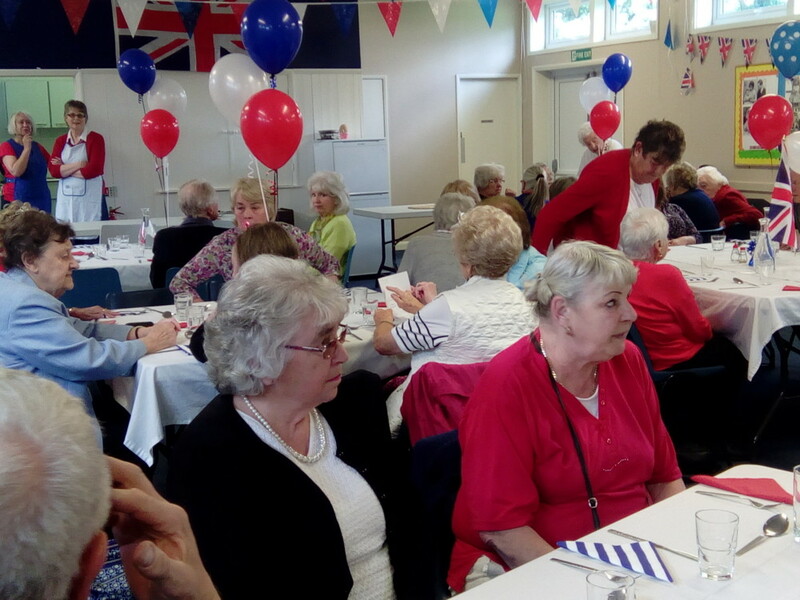 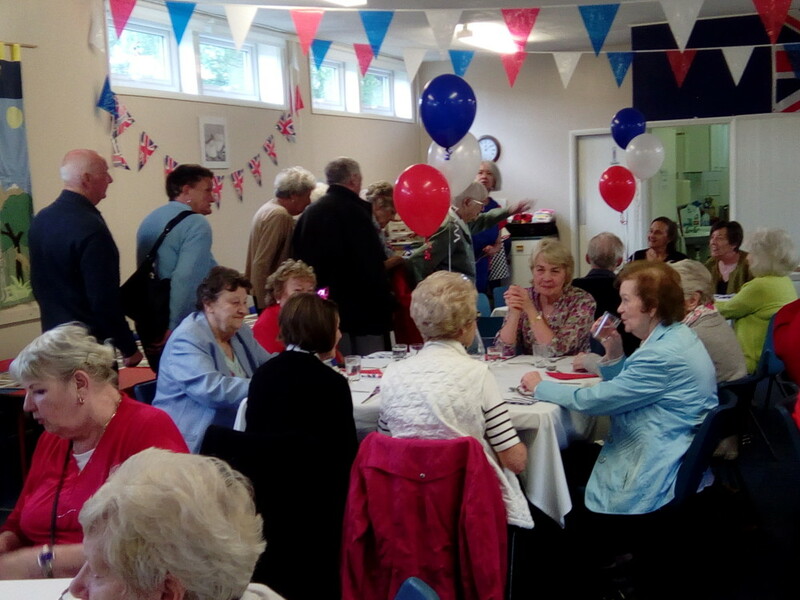 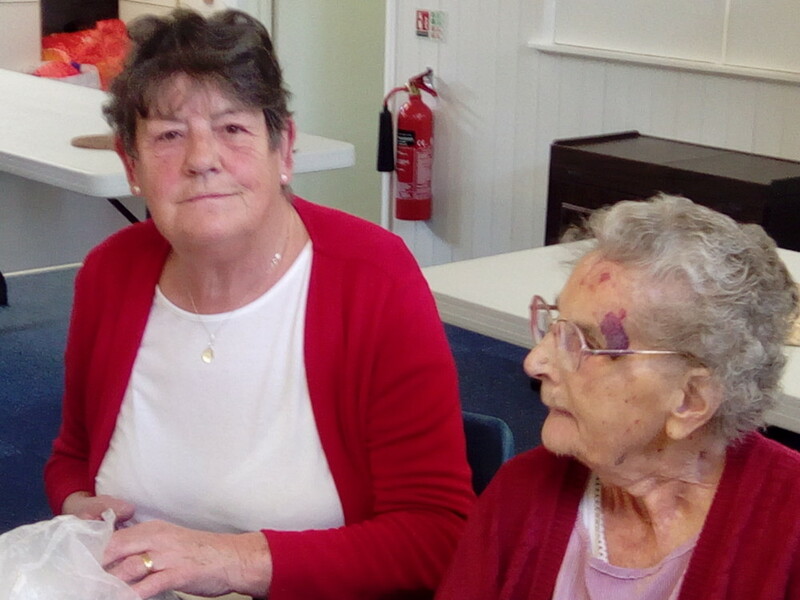 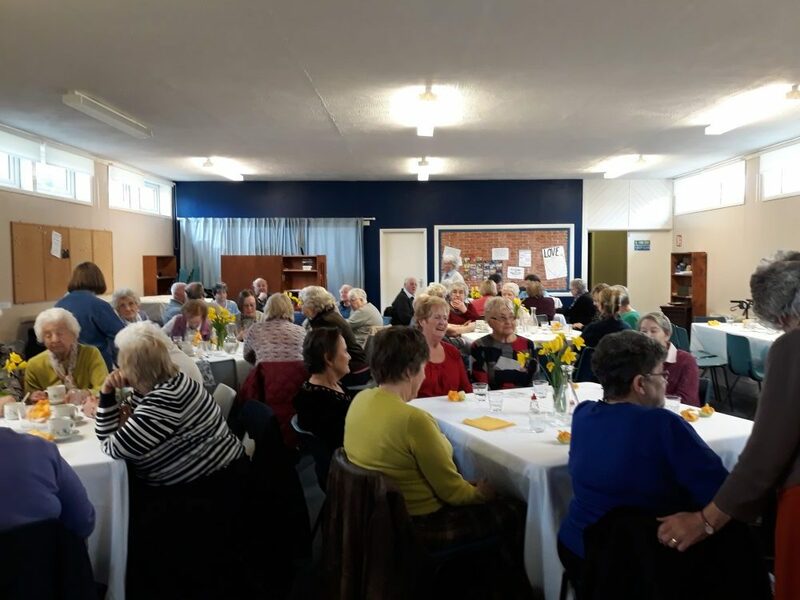 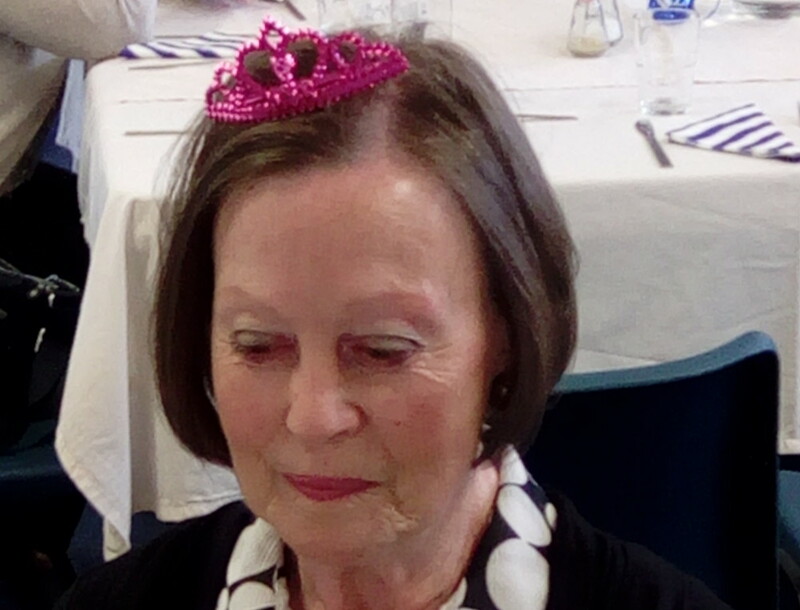 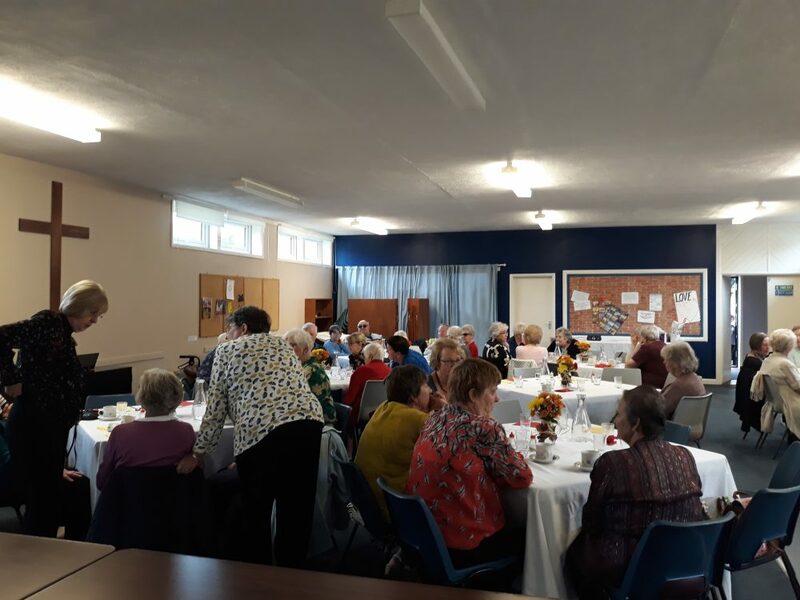 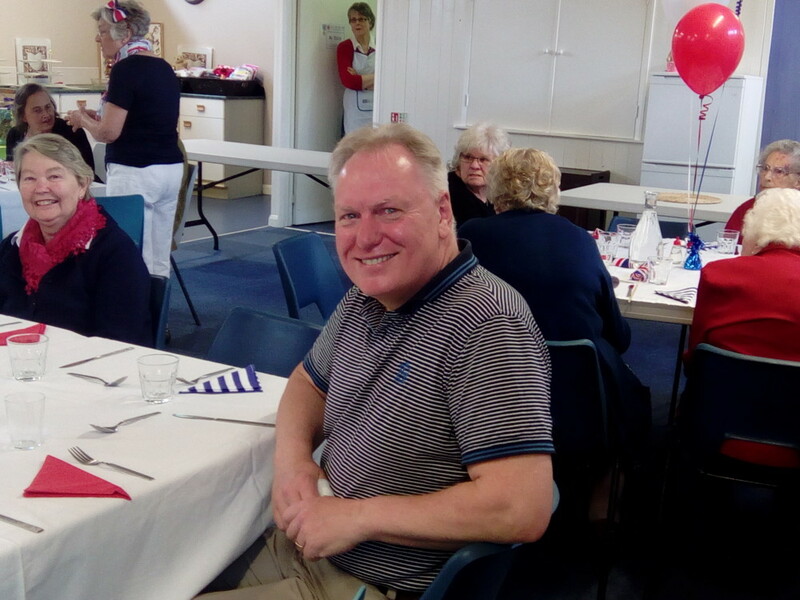 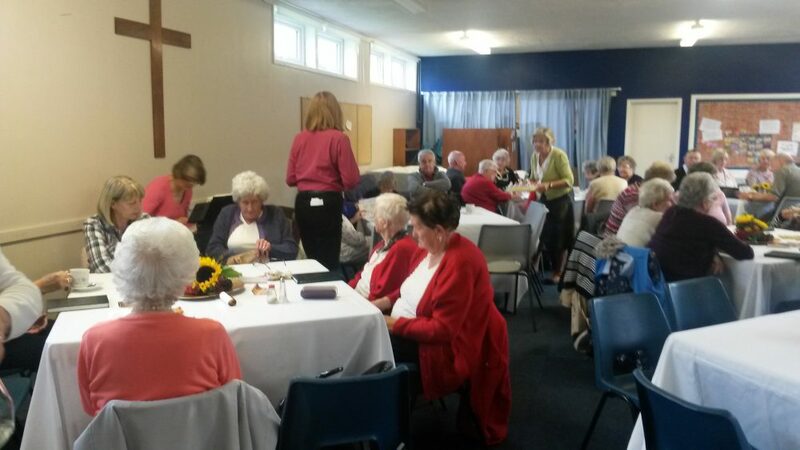 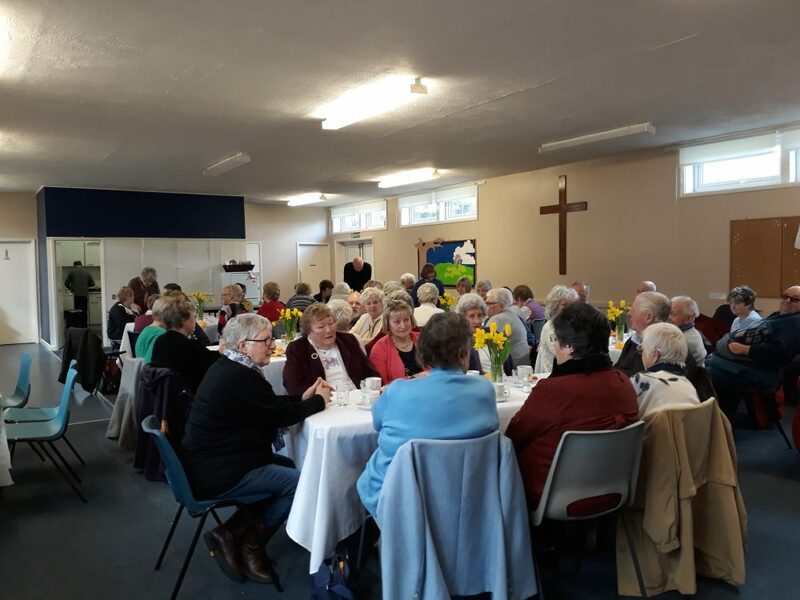 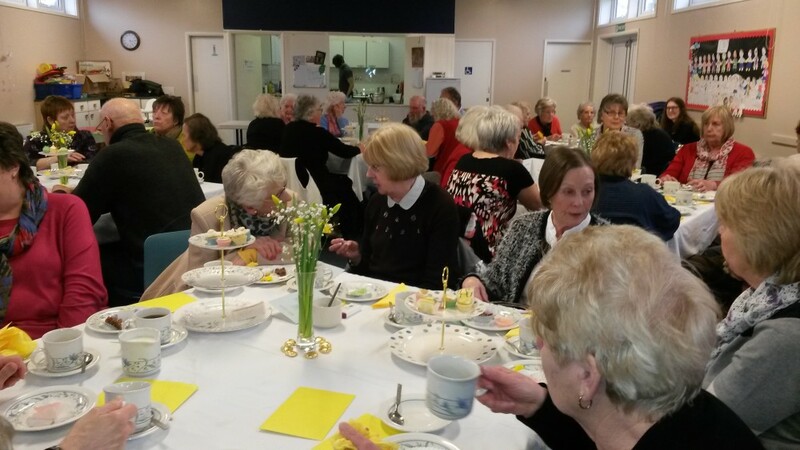 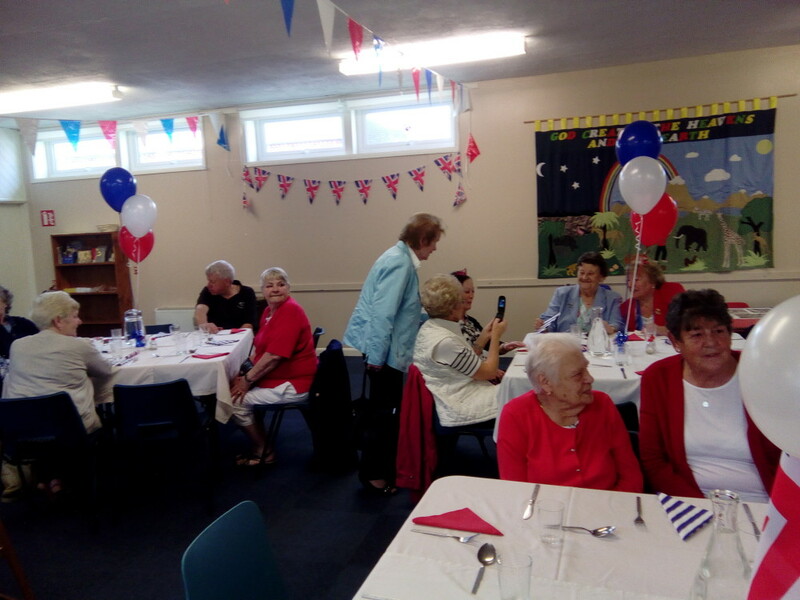 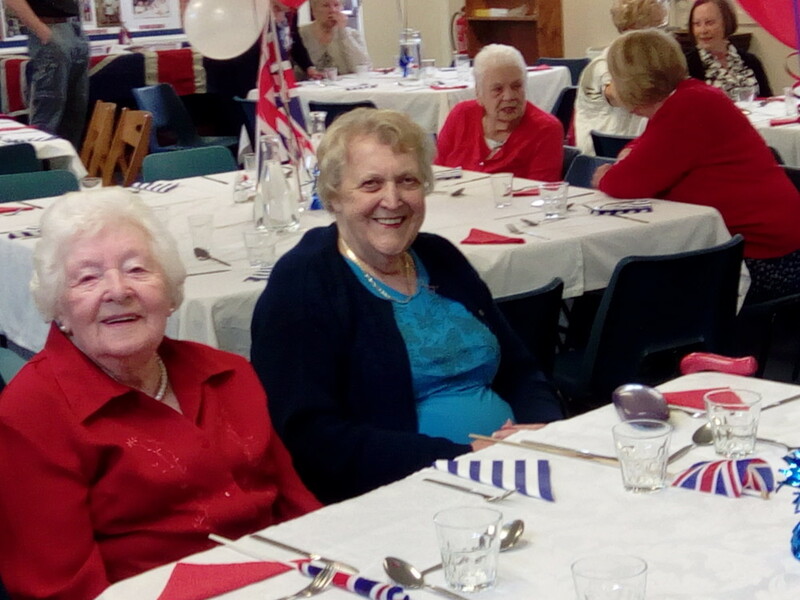 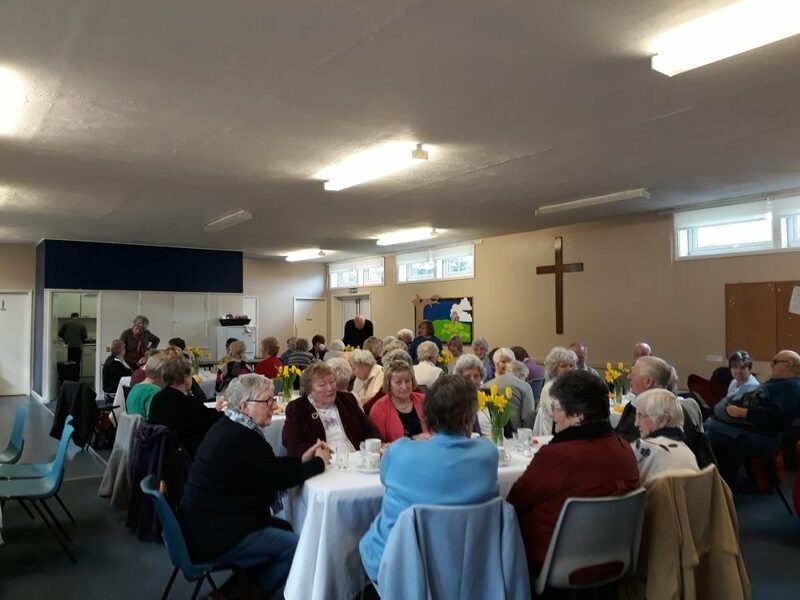 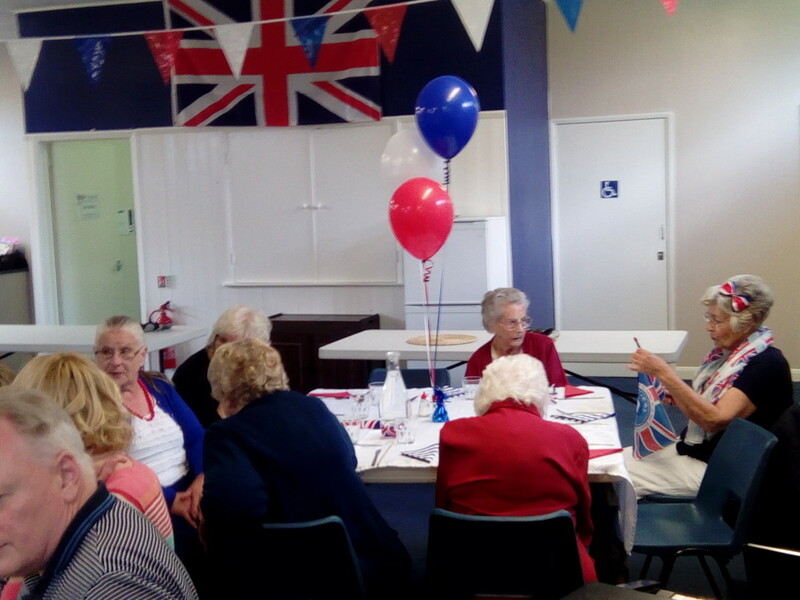 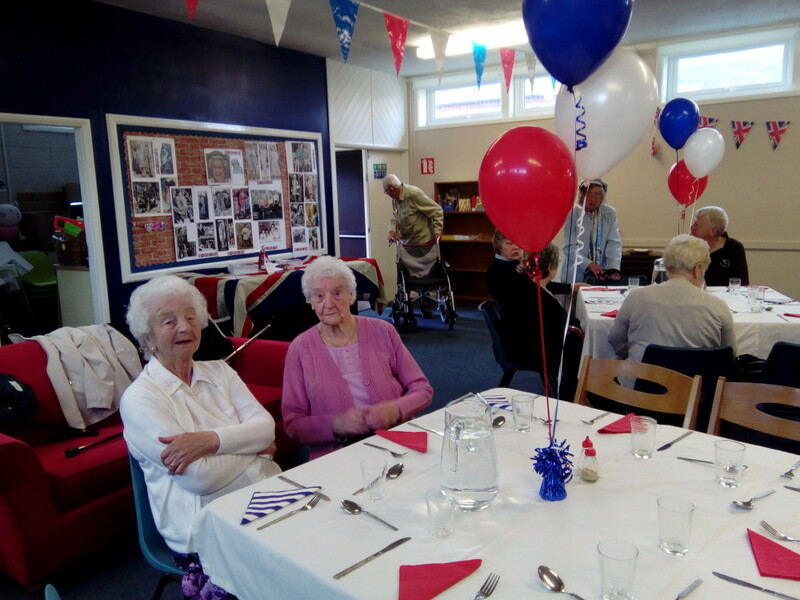 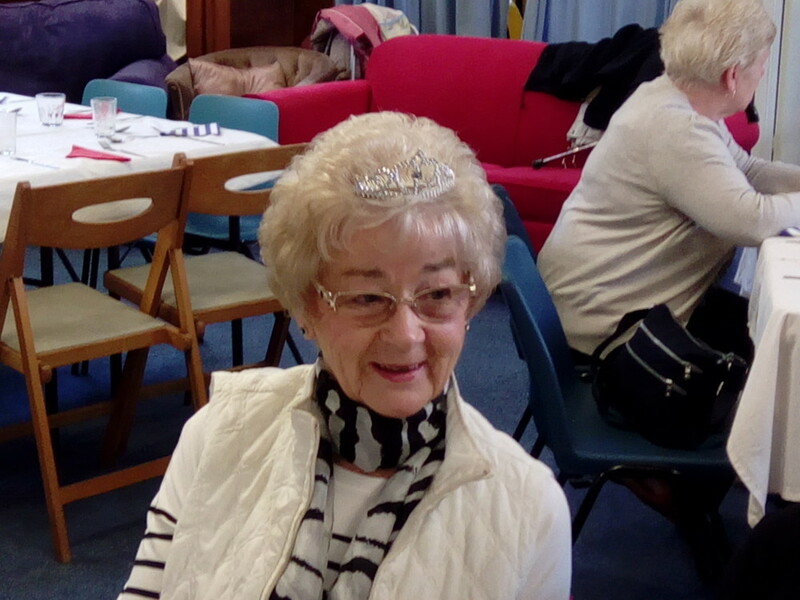 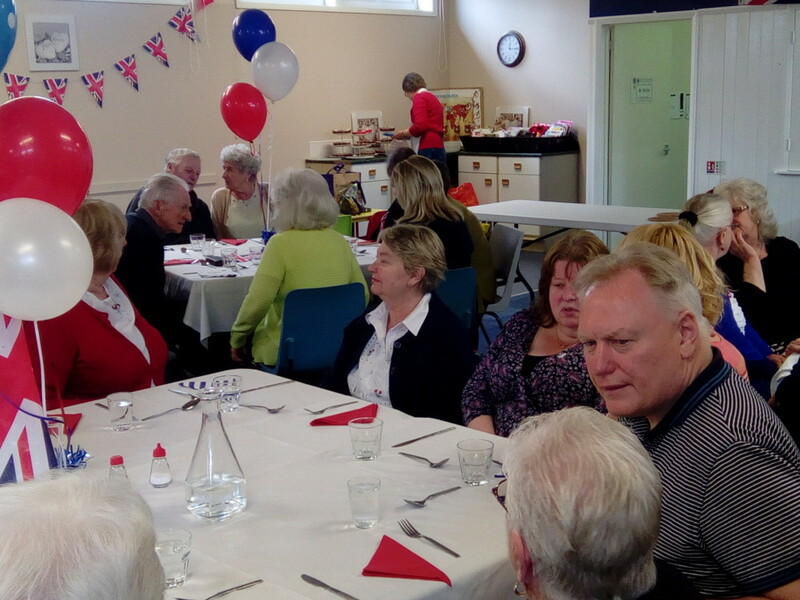 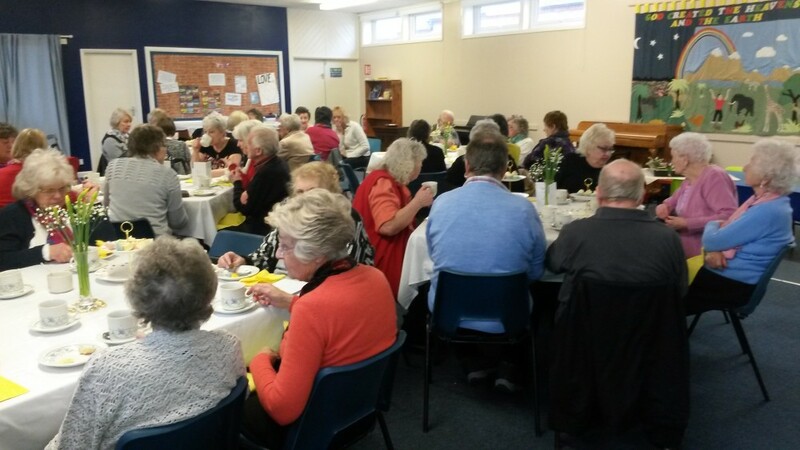 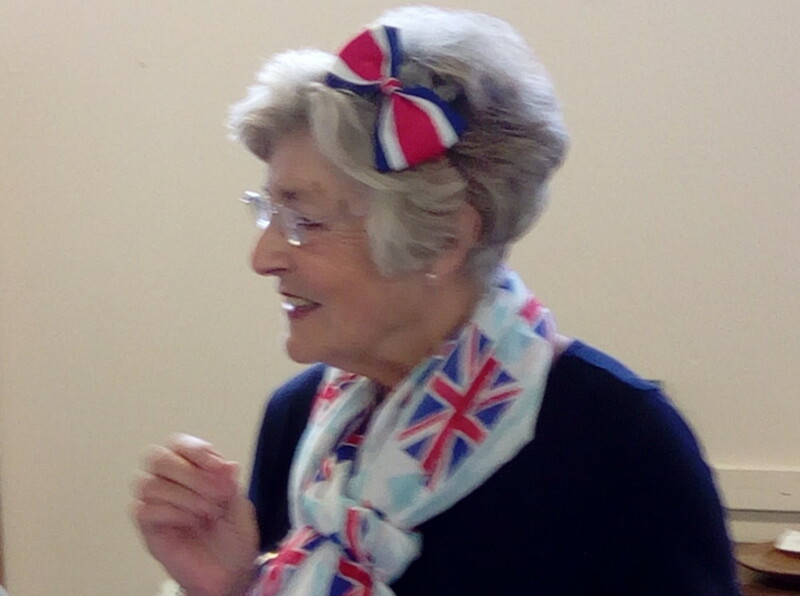 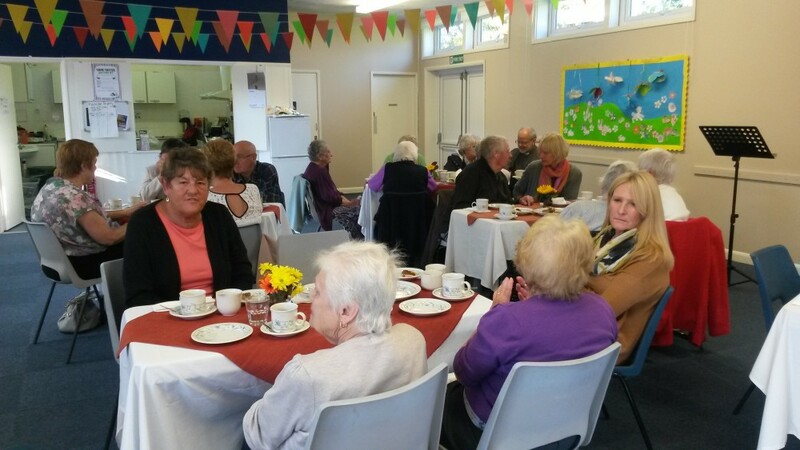 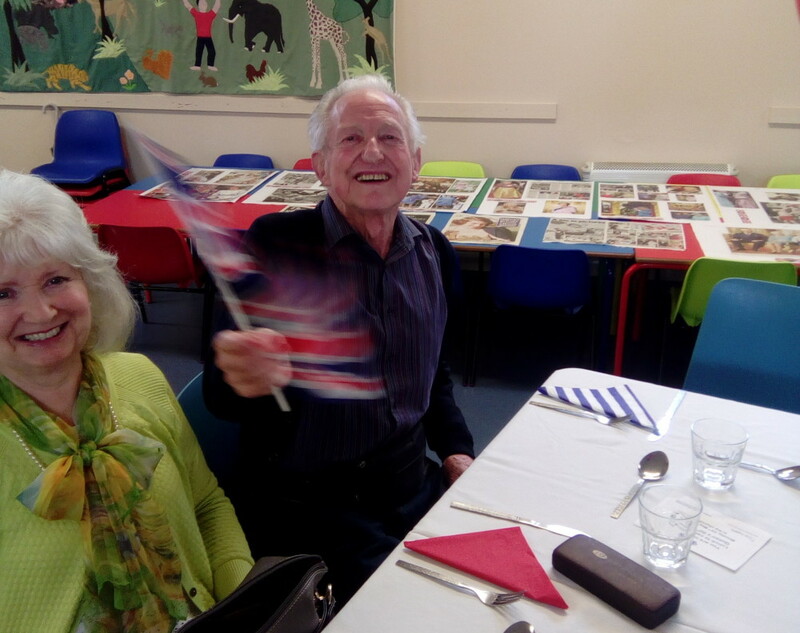 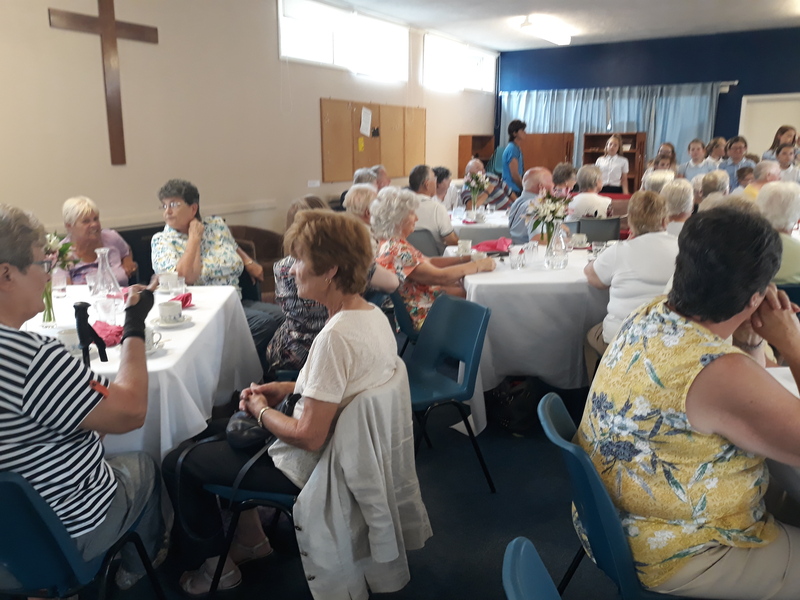 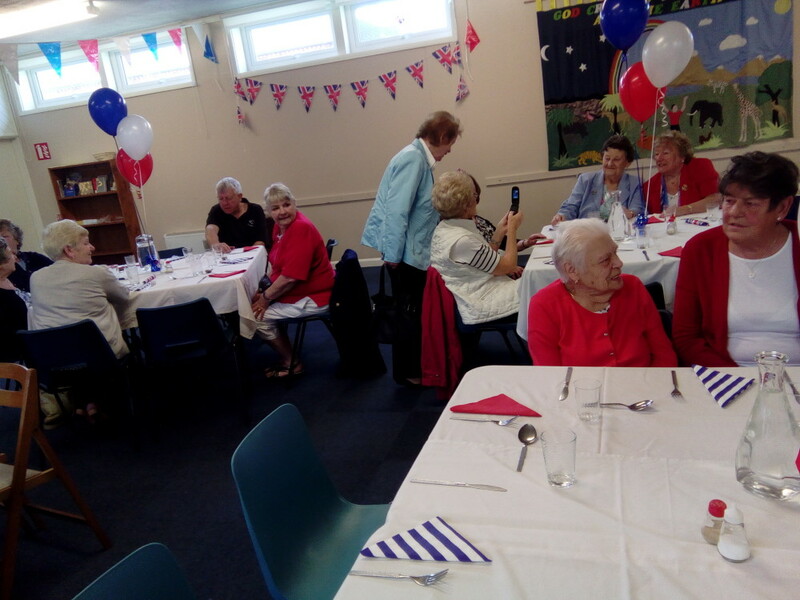 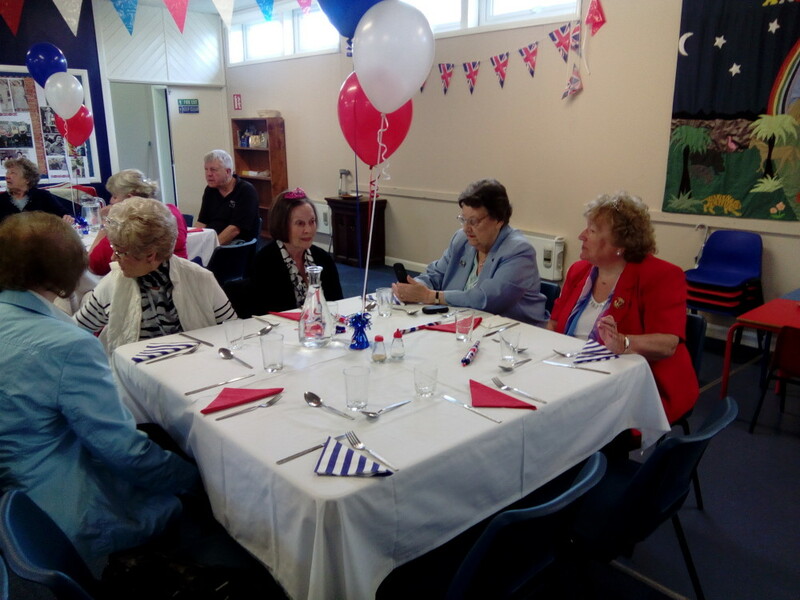 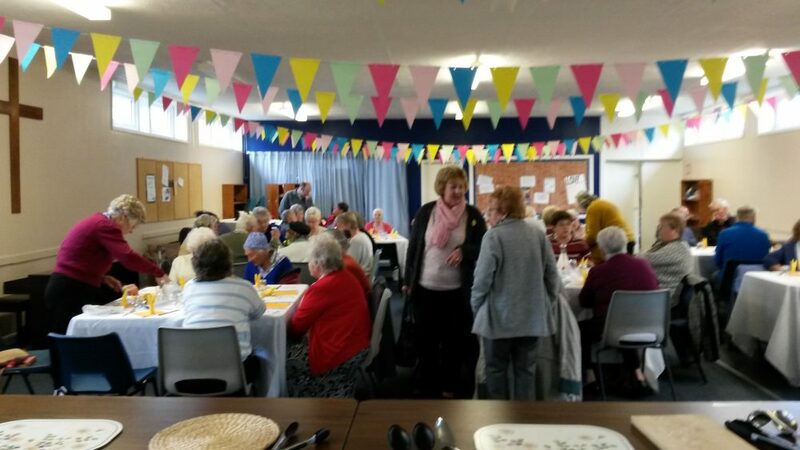 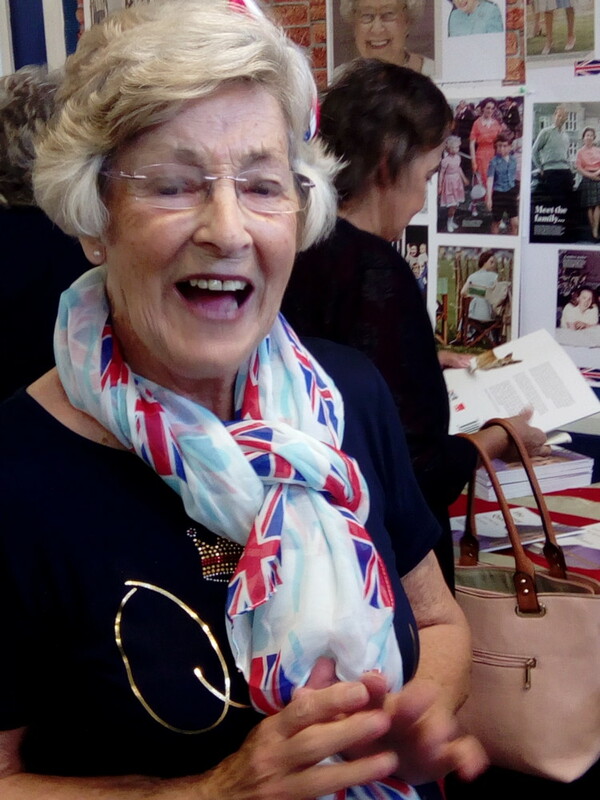 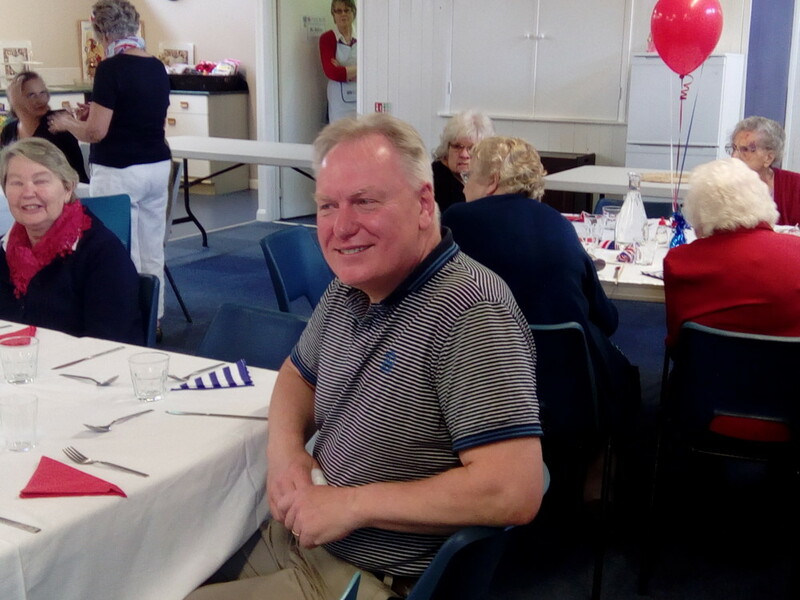 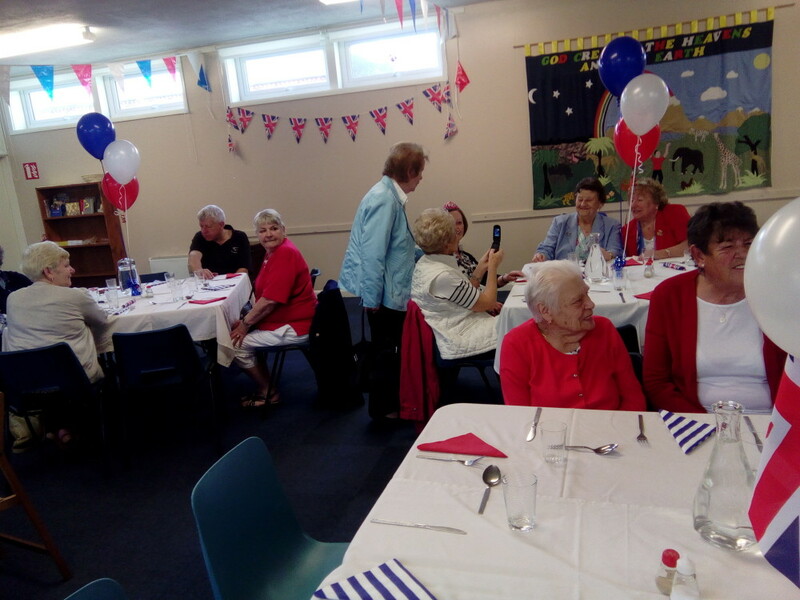 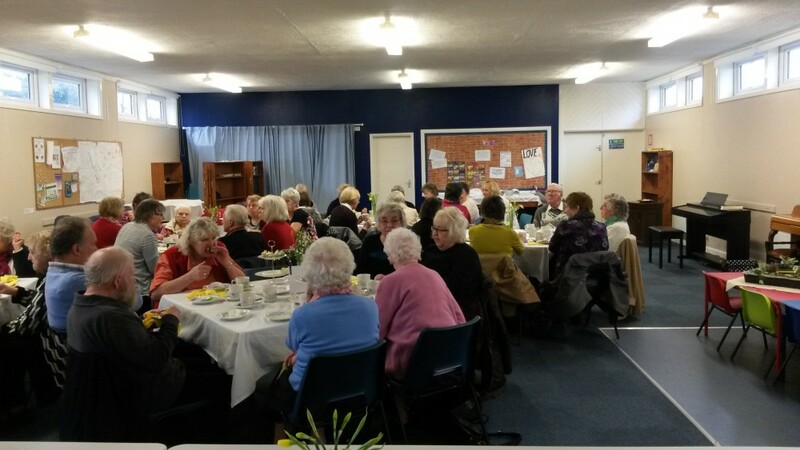 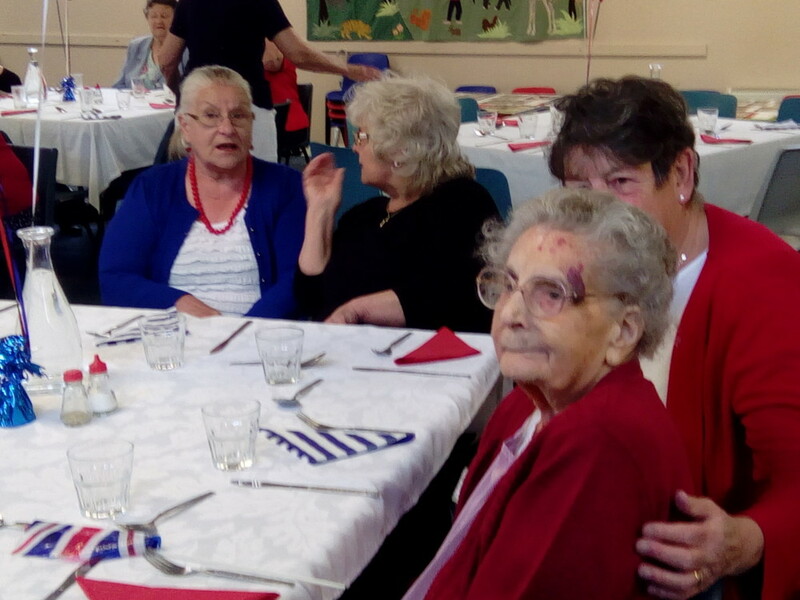 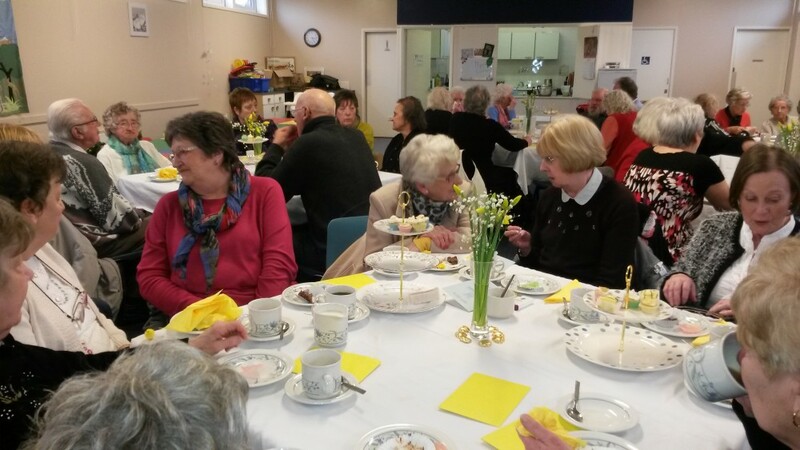 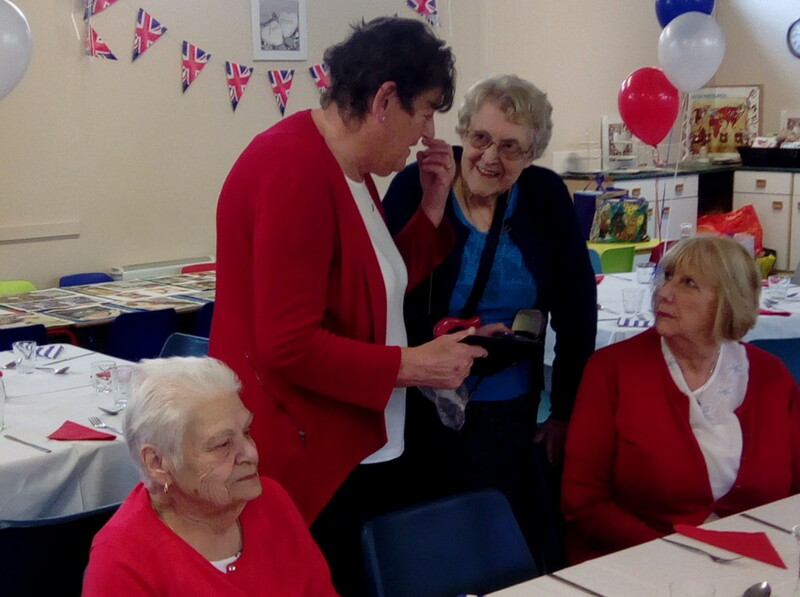 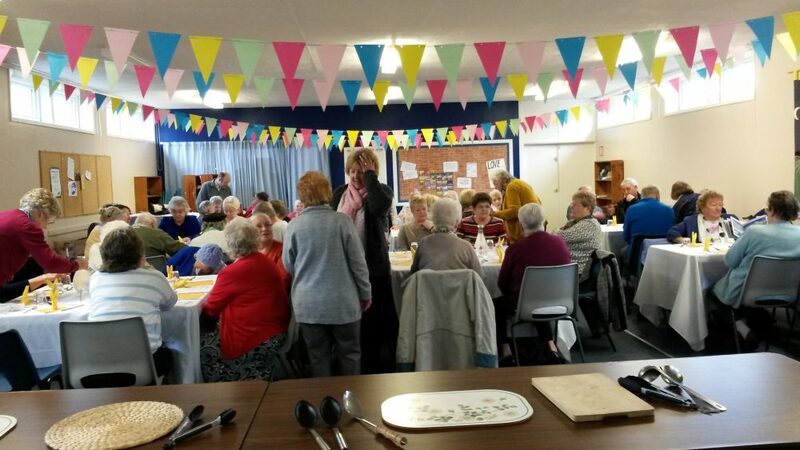 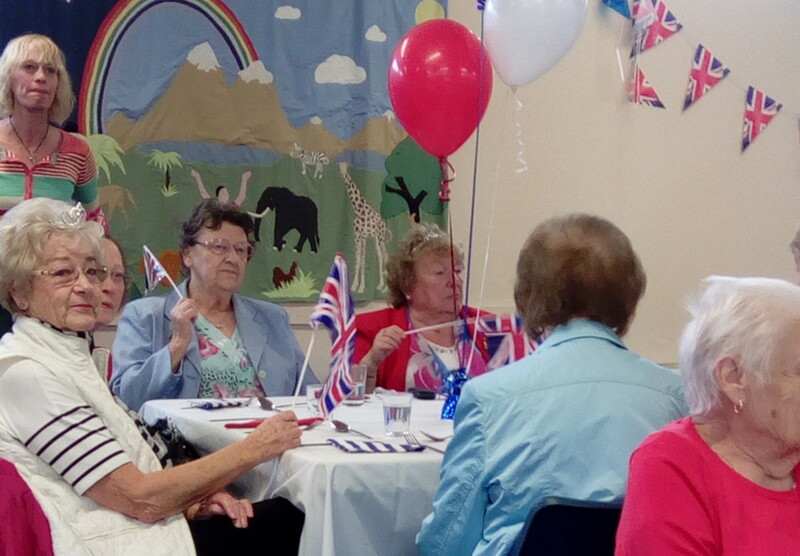 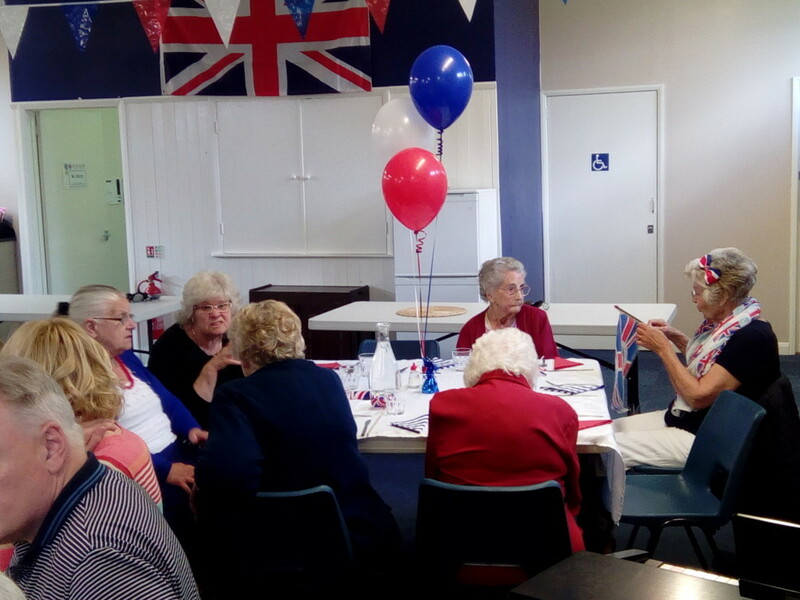 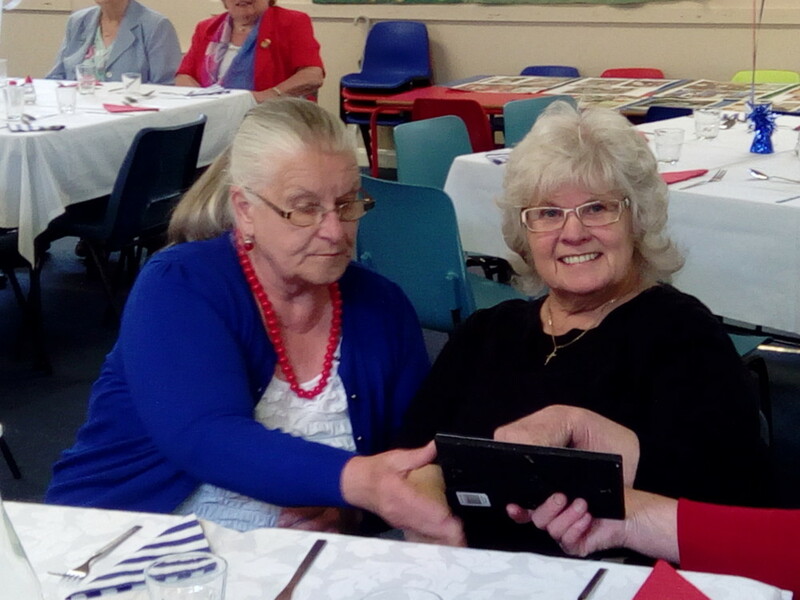 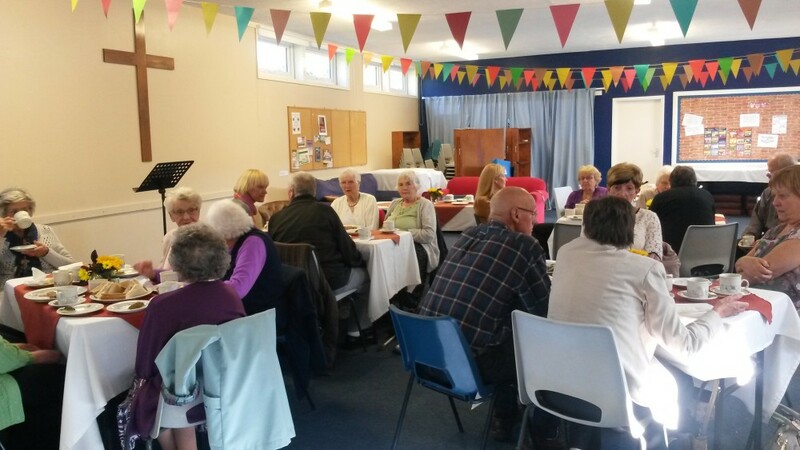 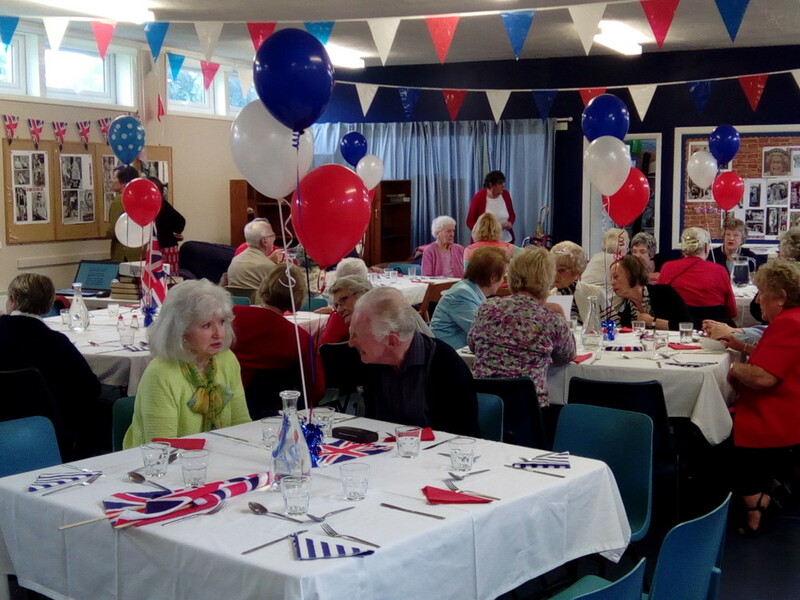 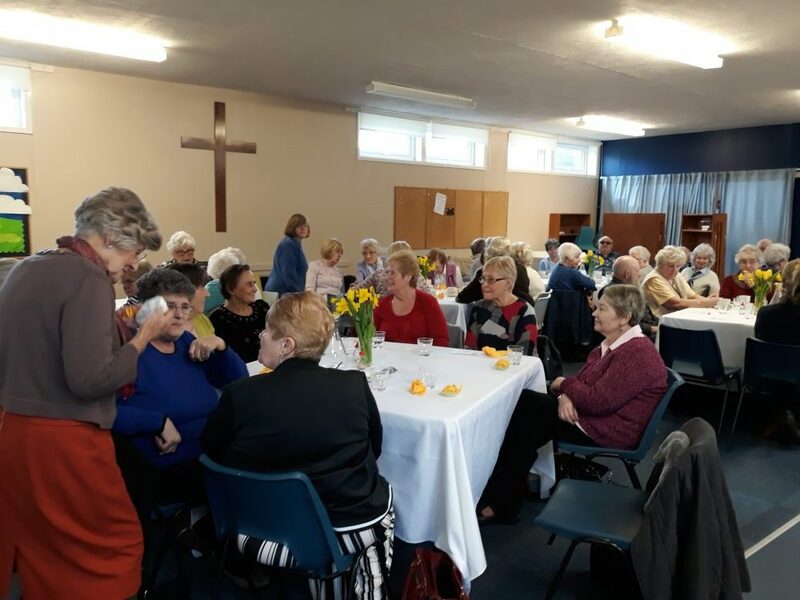 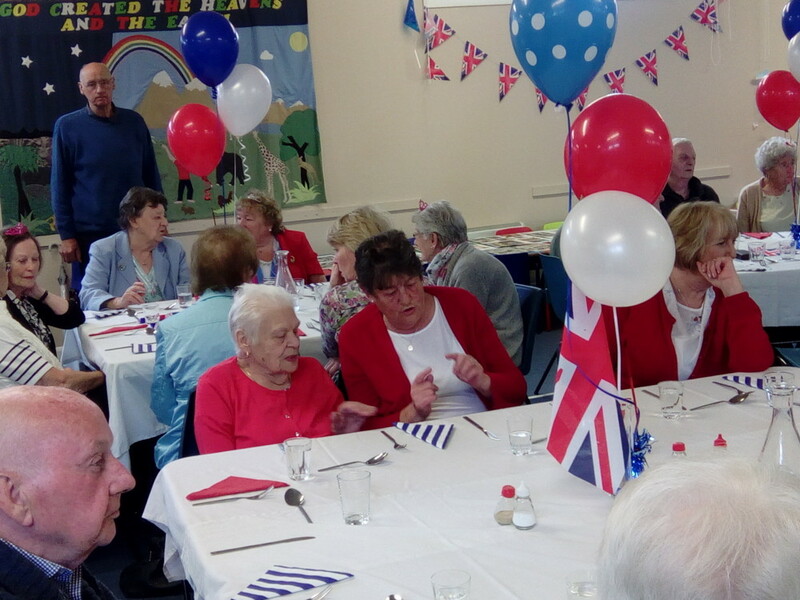 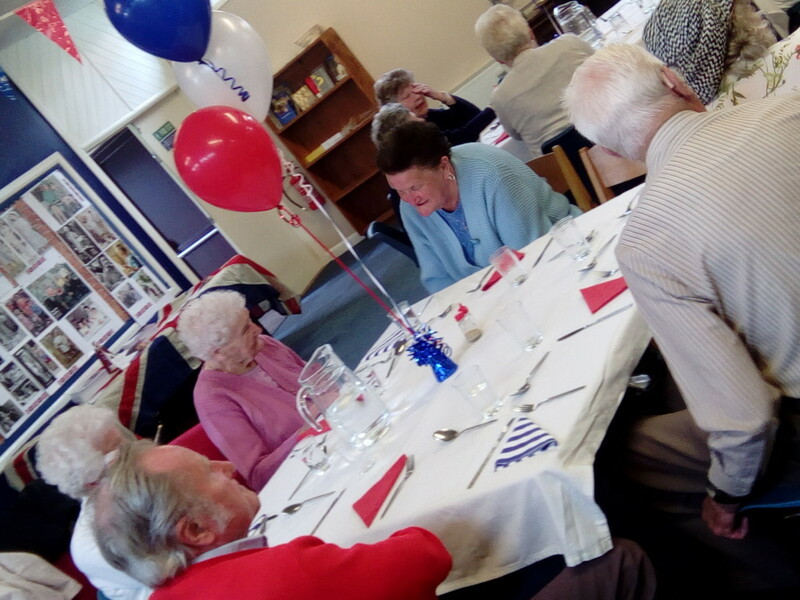 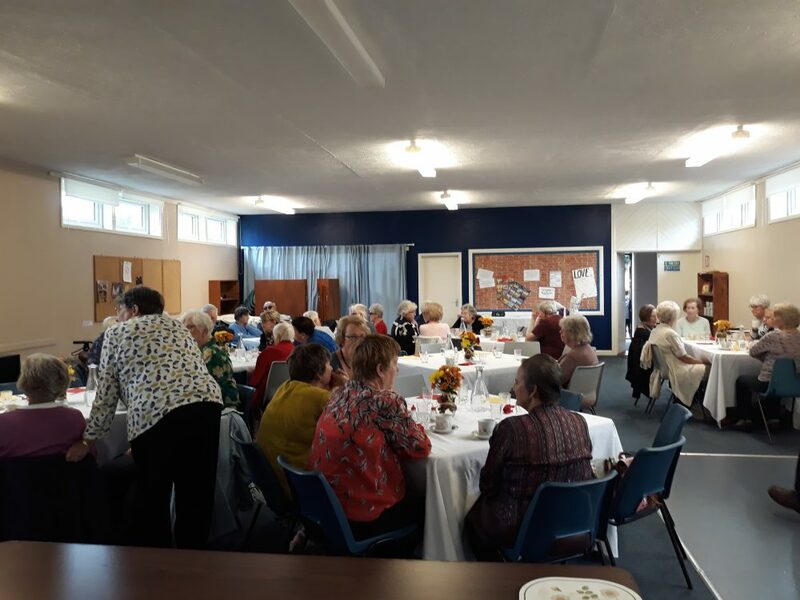 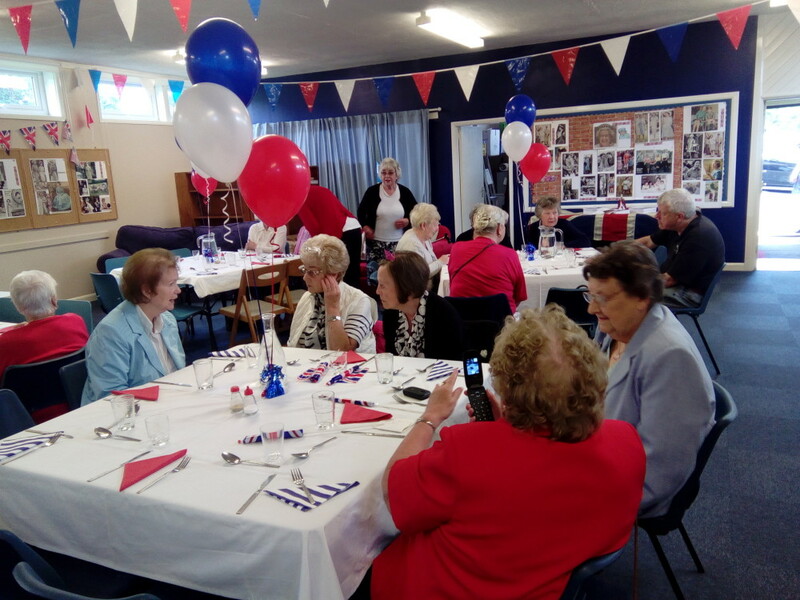 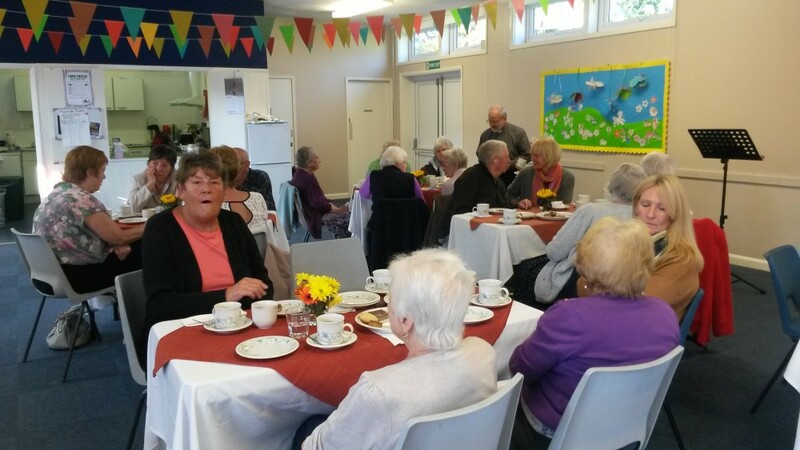 We held our Easter lunch on Monday 15th April when about 55 people gathered to enjoy a lunch of cottage pie, cauliflower cheese and carrots followed by a variety of cold desserts. 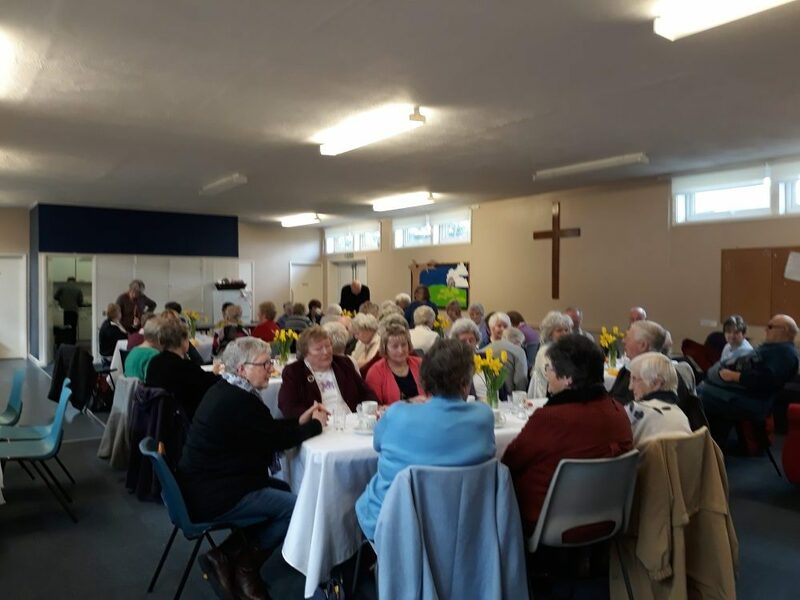 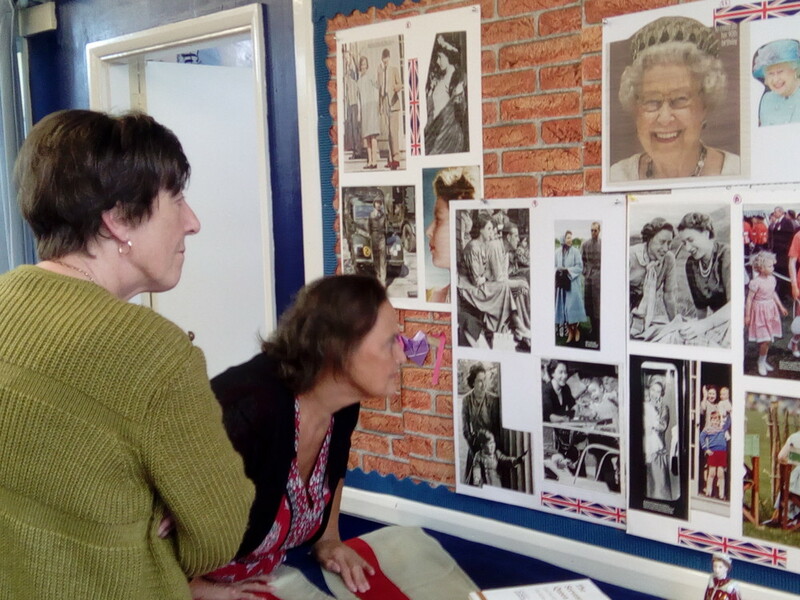 Stella gave a talk about the meaning of Easter and Sandra played some favourite Easter hymns for everyone to join in with. 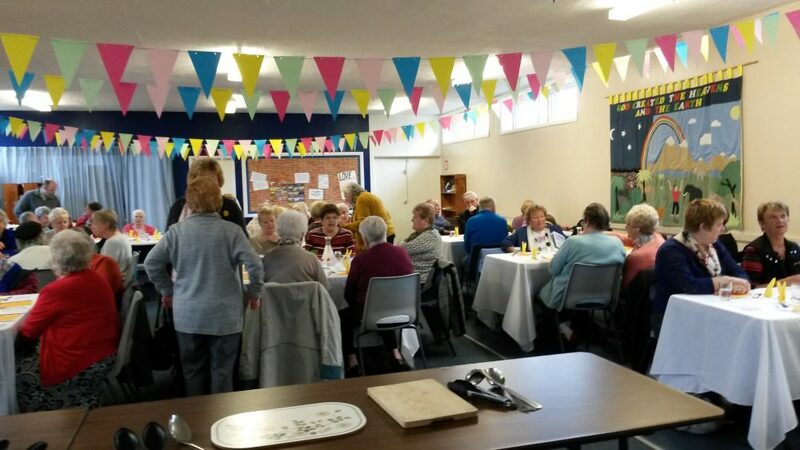 Thanks to all who helped to make the occasion a success. 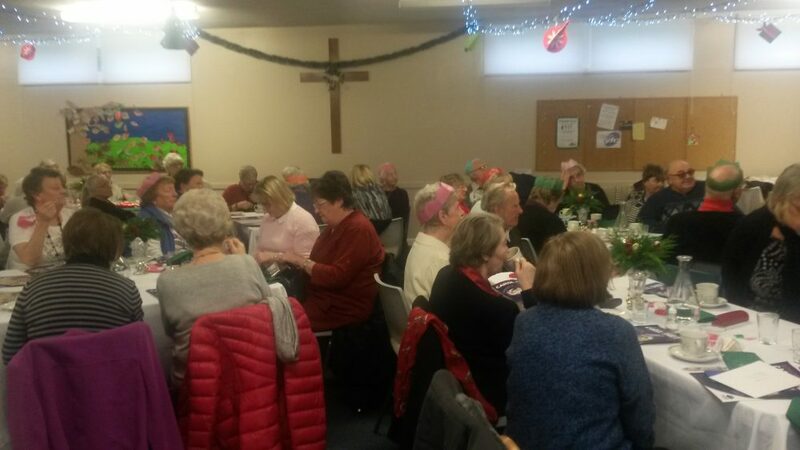 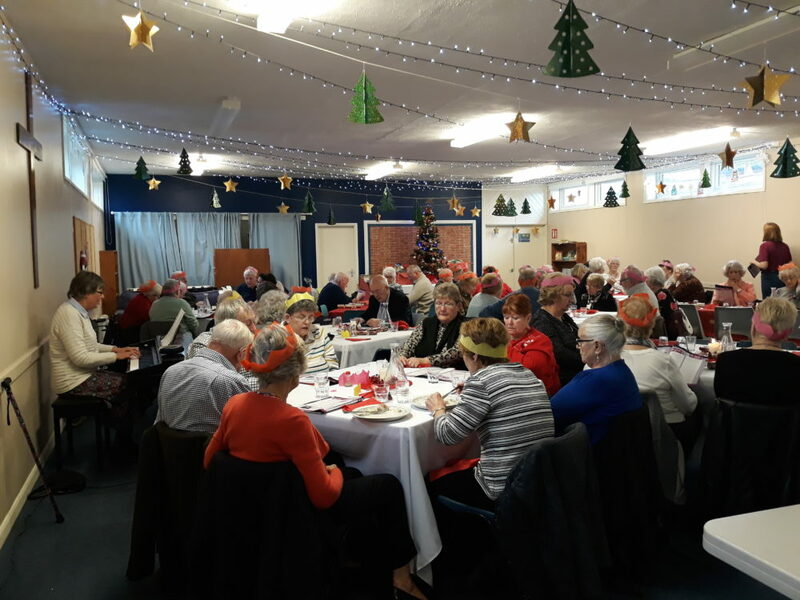 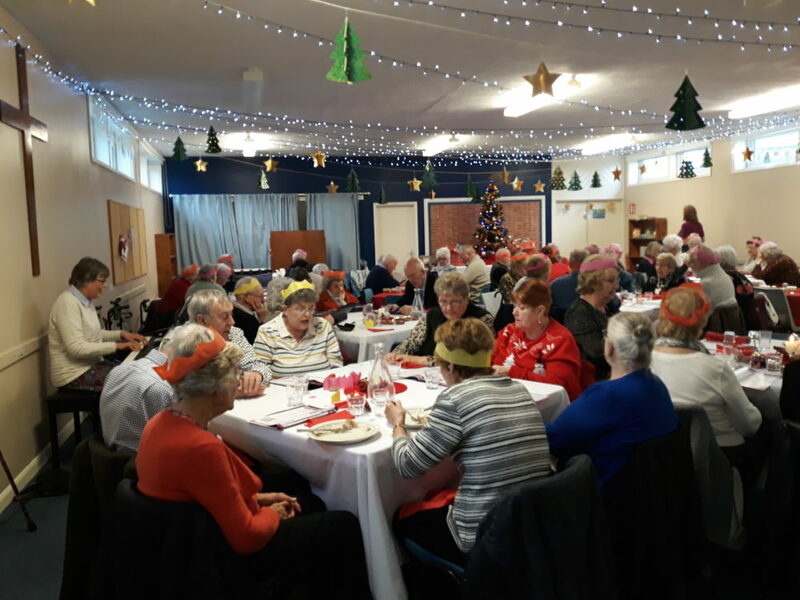 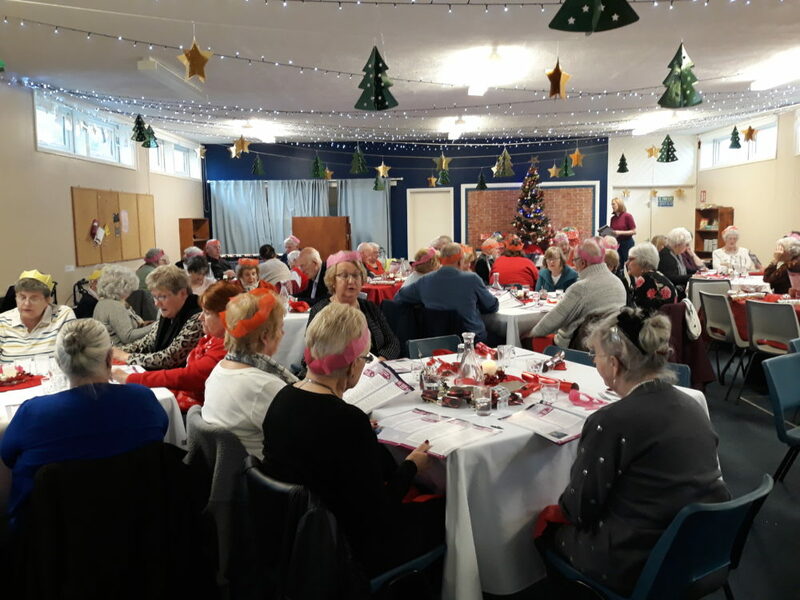 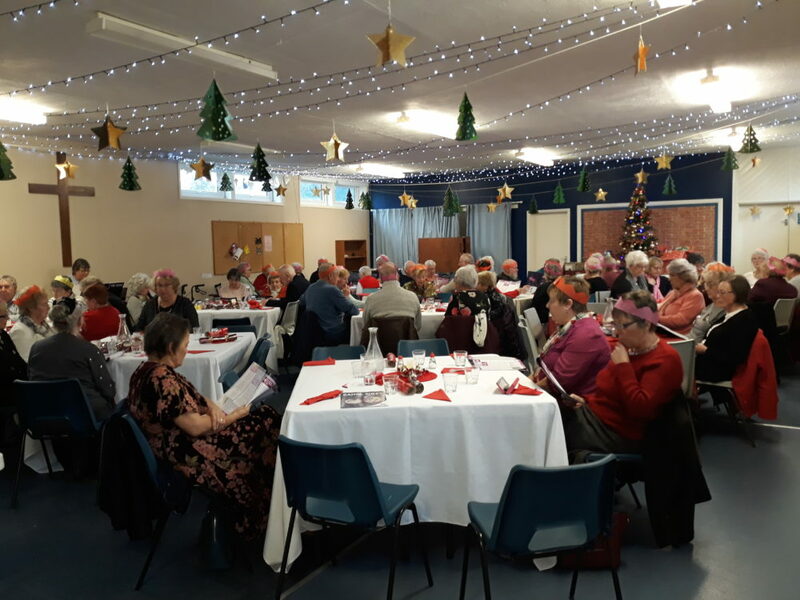 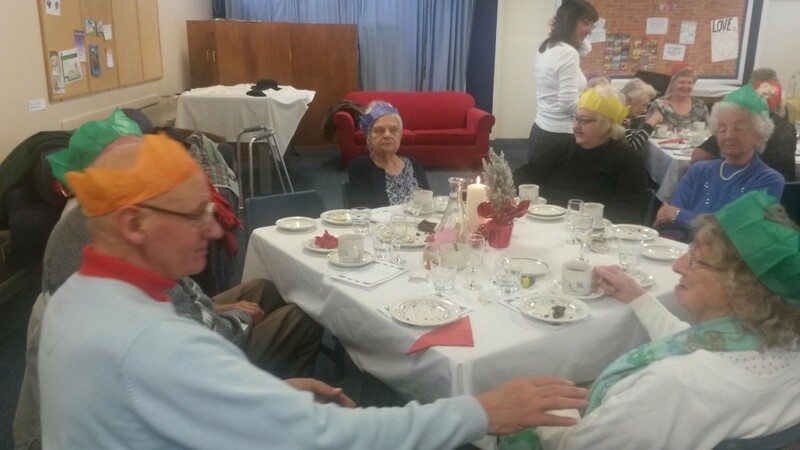 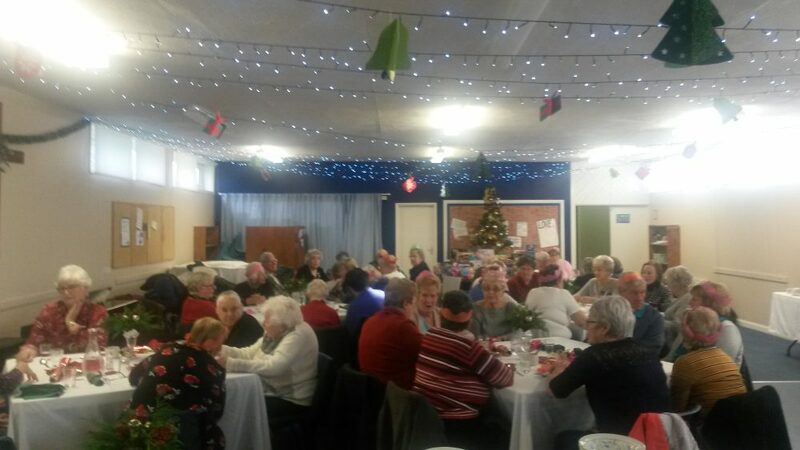 Over 60 people came to the Christmas lunch on Monday 3rd December. 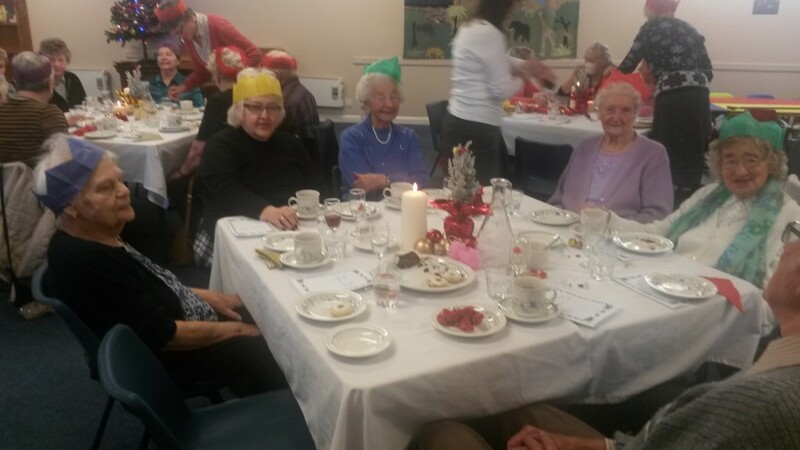 We sang Christmas carols, accompanied by Sandra, and our curate, Stella, shared some thoughts on celebrating Christmas. 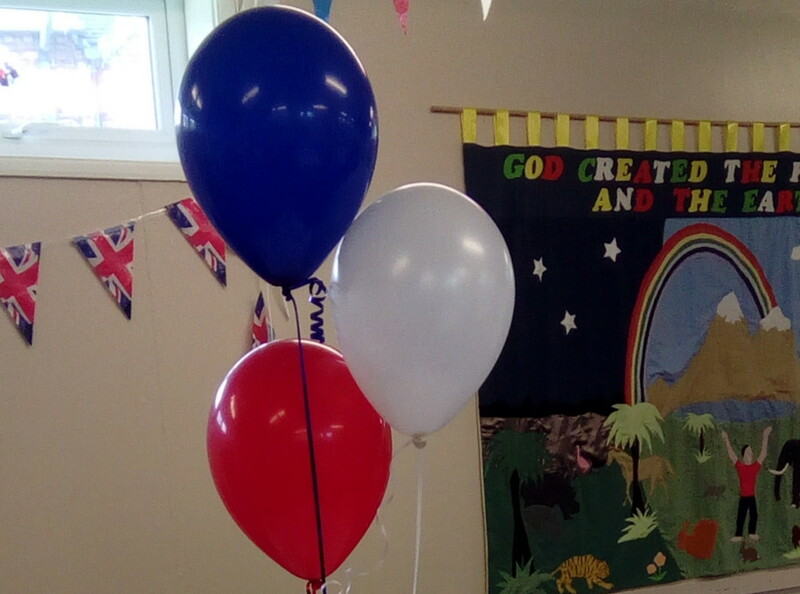 Graham told everyone about our forthcoming Angel Festival and gave out angels to decorate. 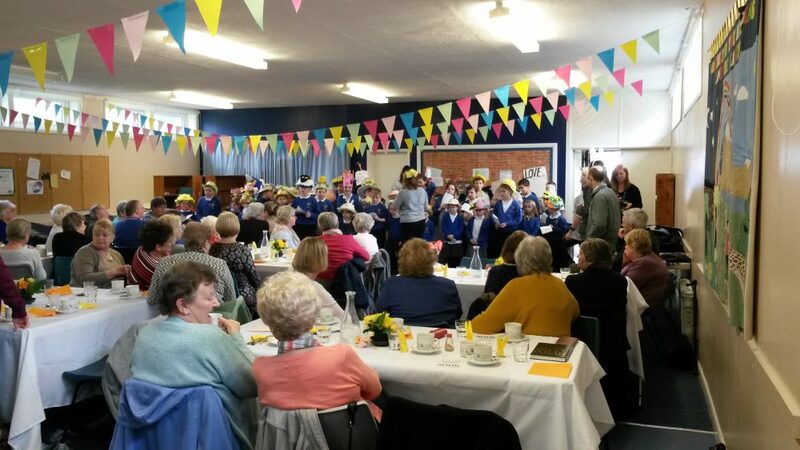 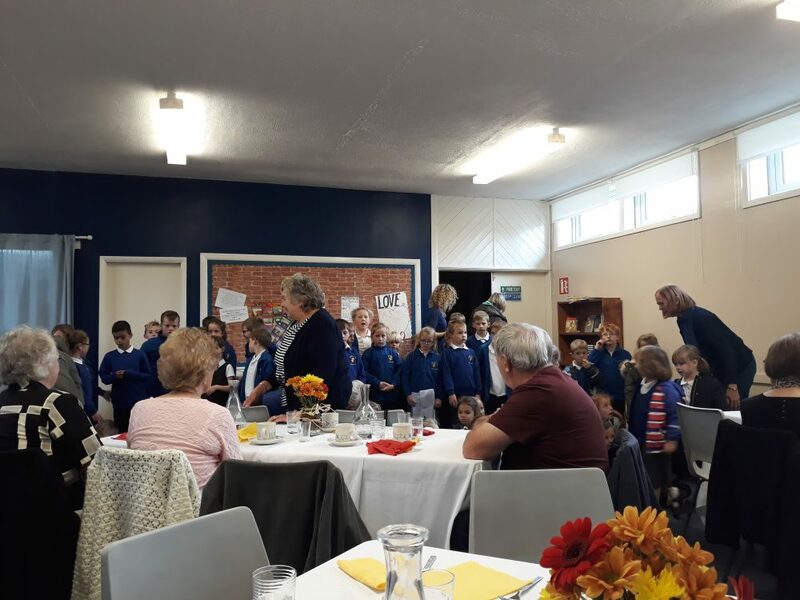 Children from Hartshorne came to entertain us at our Harvest Lunch on !st October 2018. 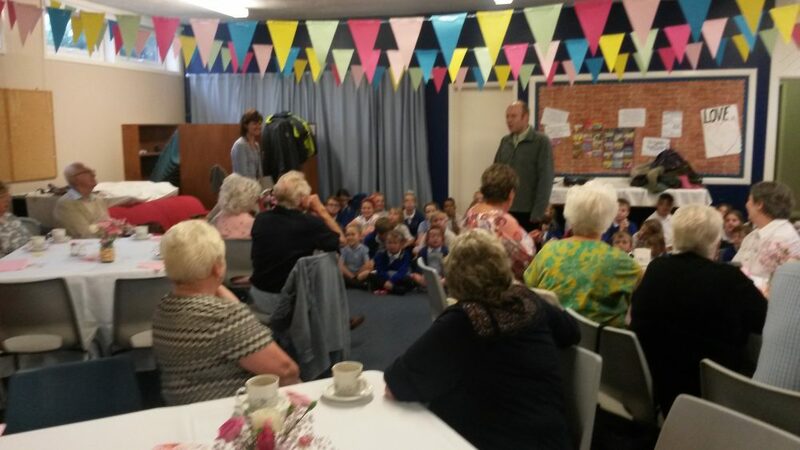 They showed their harvest prints, read poems ad sang songs. 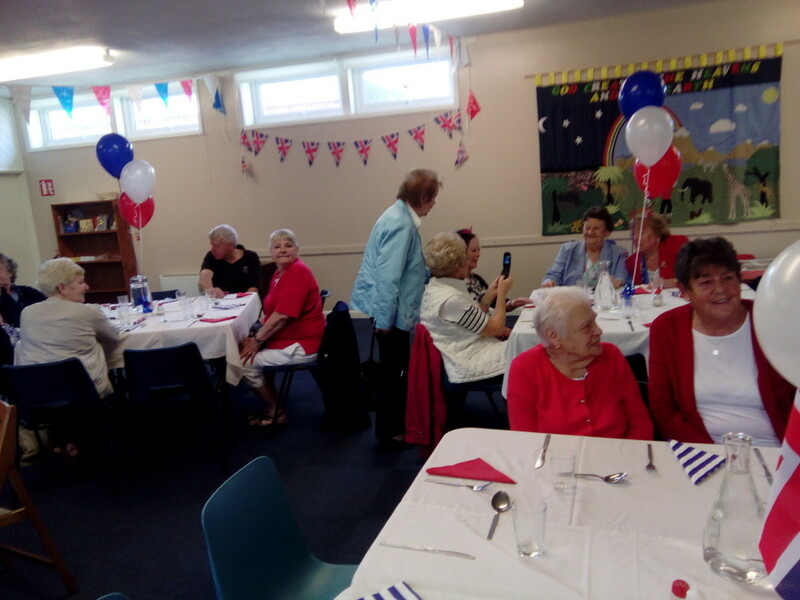 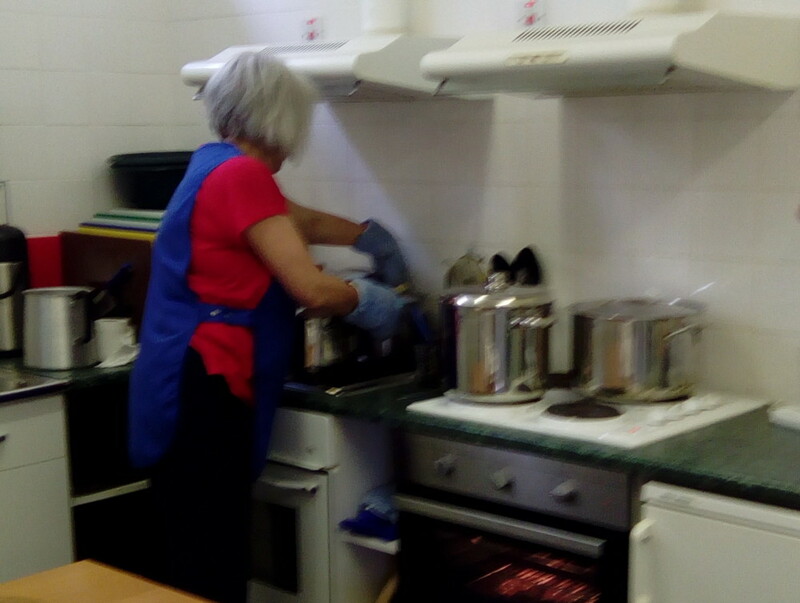 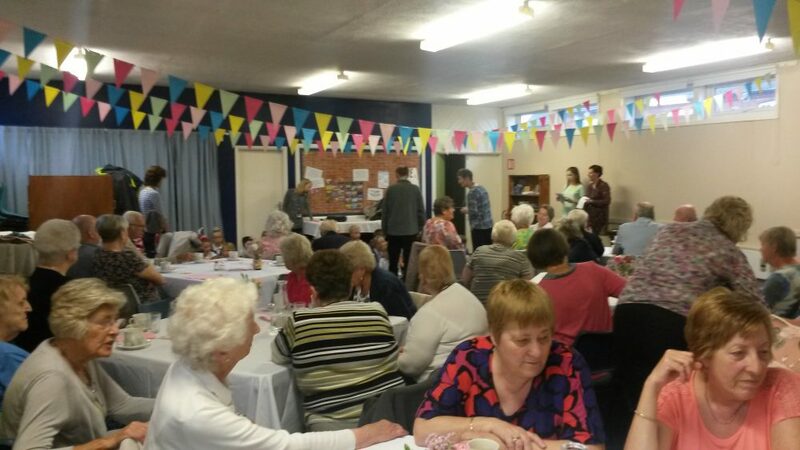 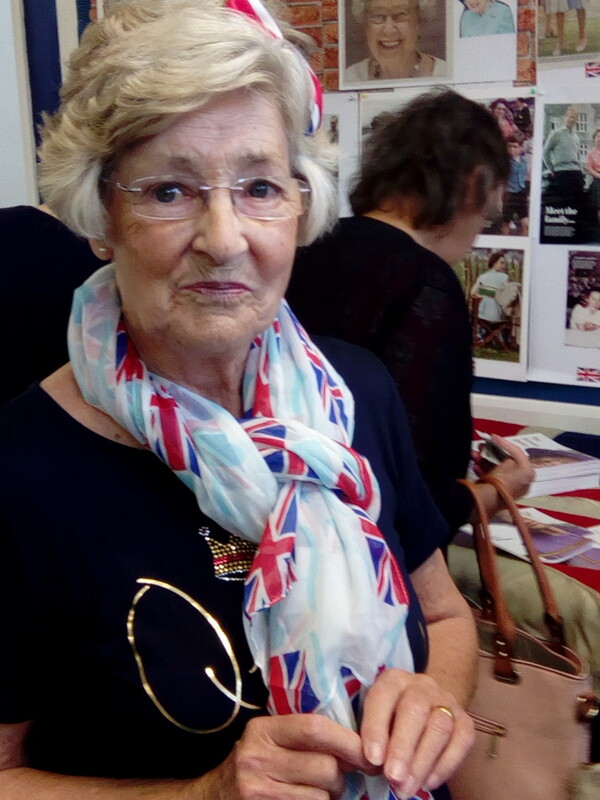 Around fifty people attended and enjoyed a meal of sausage, beans and mash followed by plum or apple crumble or fruit meringue nests. 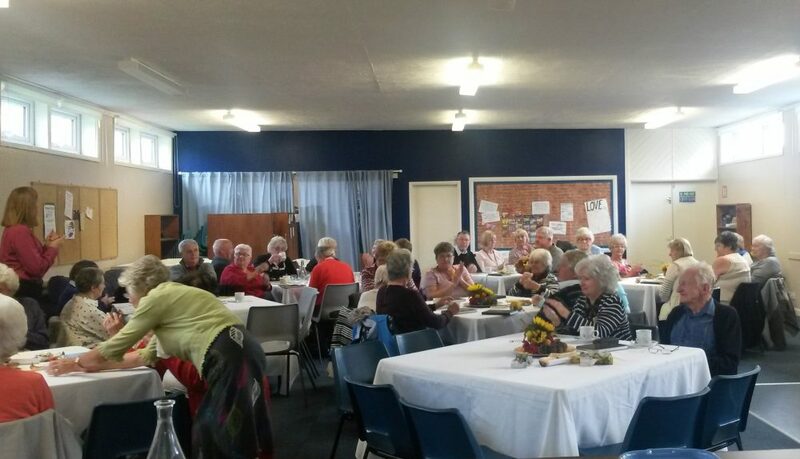 Rev Stella Greenwood gave a short talk on harvest. 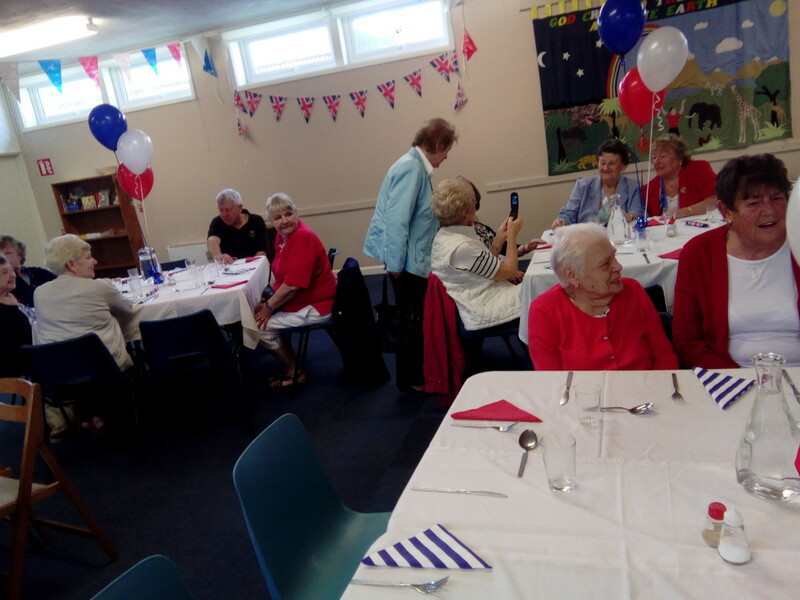 About sixty people came to our summer lunch on 9th July. 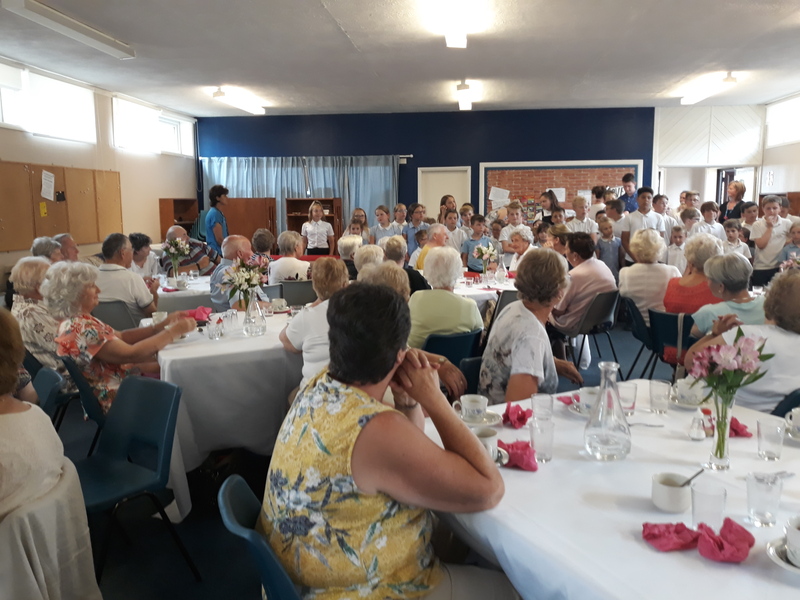 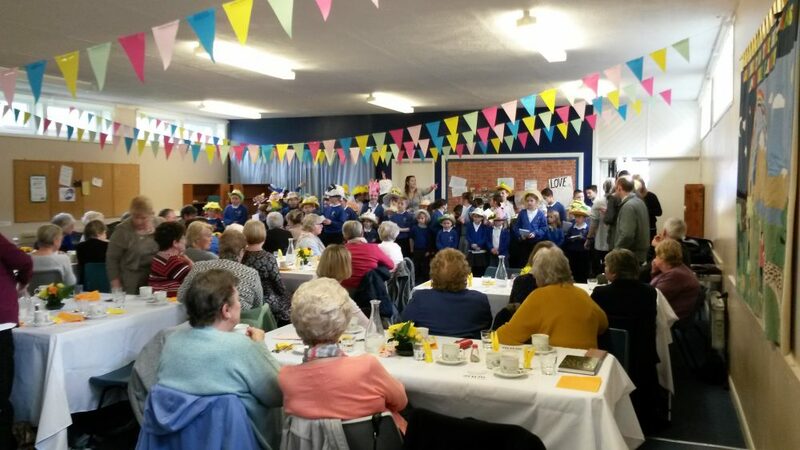 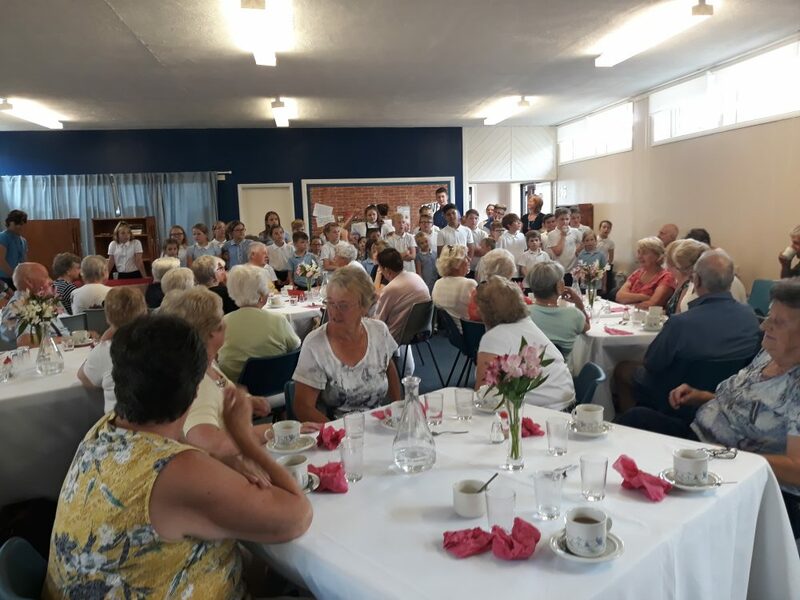 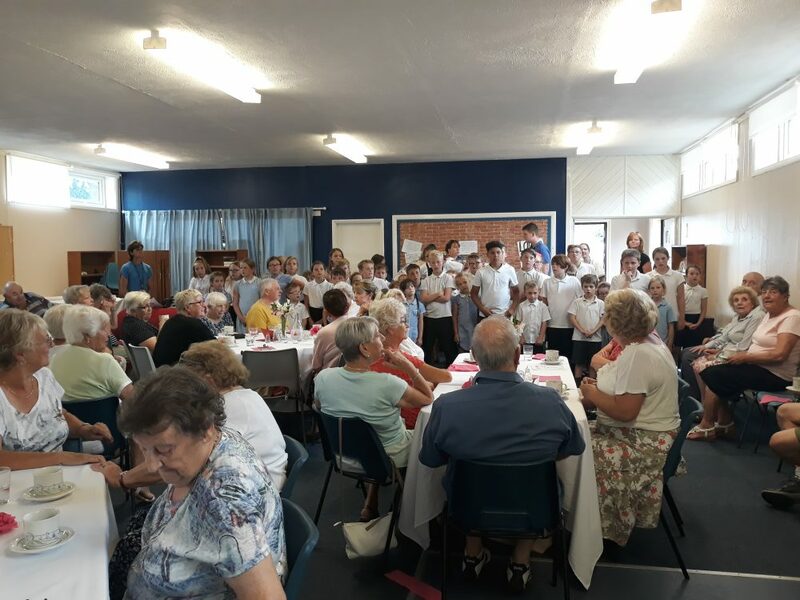 After a lunch of lasagne and salad followed by a selection of cold desserts we were entertained by children from Hartshorne Primary School who sang some lively songs and gave us a taste of their end of term production. 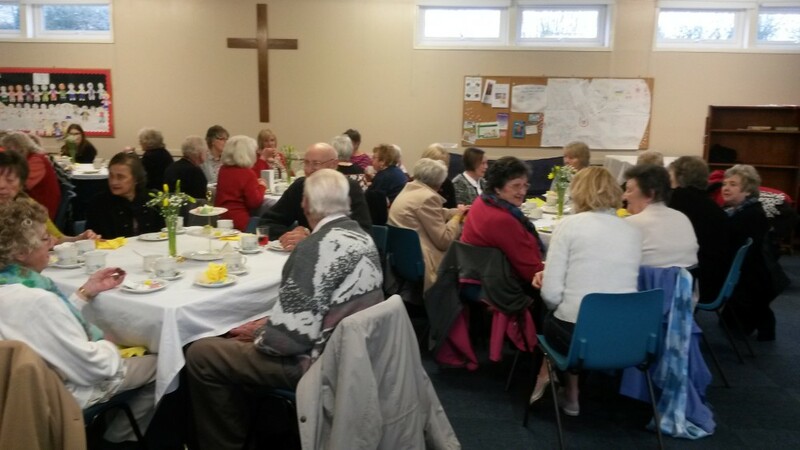 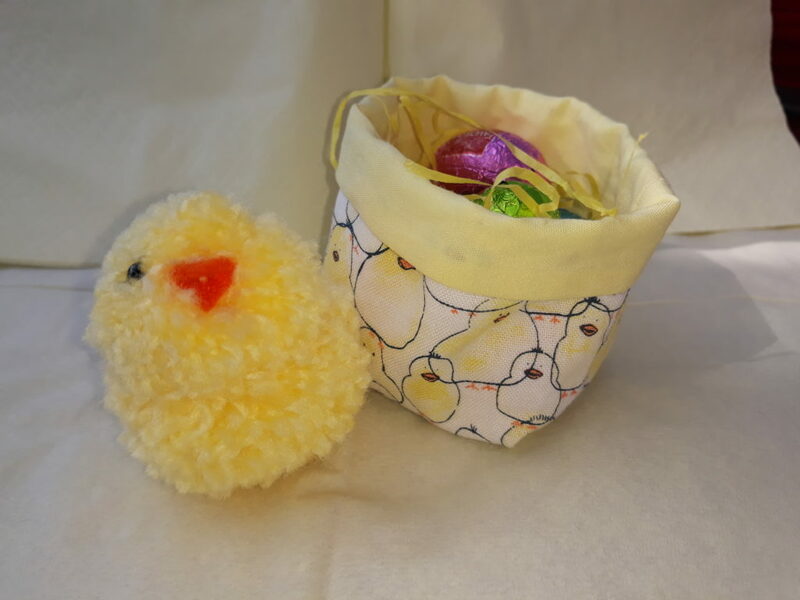 Our Easter lunch was attended by 56 people. 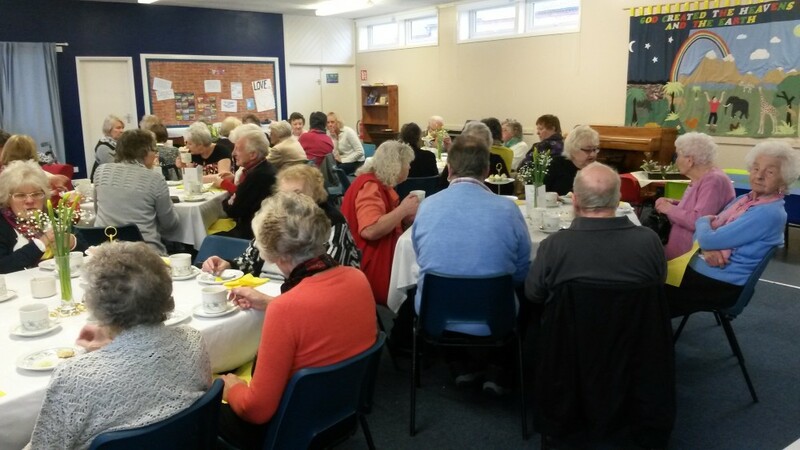 Traditional shepherd’s pie was on the menu followed by apple crumble, chocolate egg nests and tea or coffee. 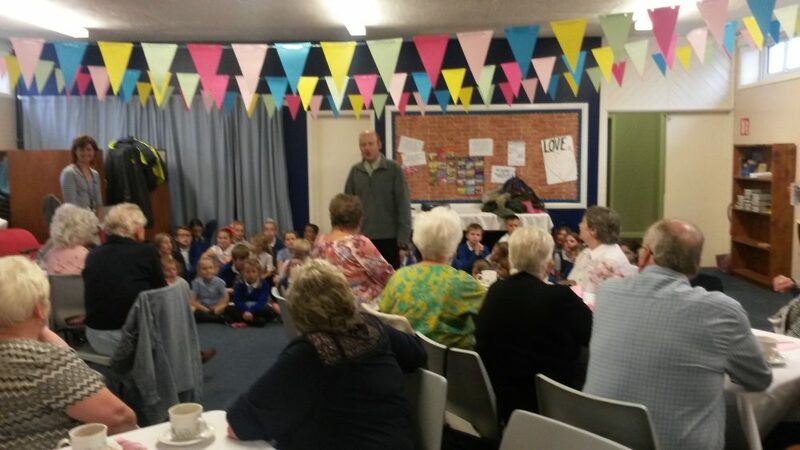 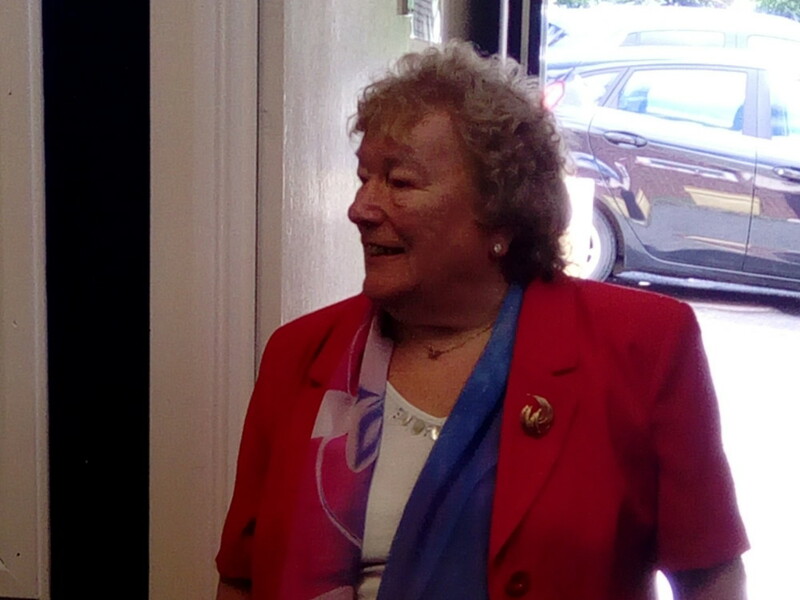 Rev Stella Greenwood gave a short talk on the meaning of Easter then Sandra led us in singing some Easter hymns. 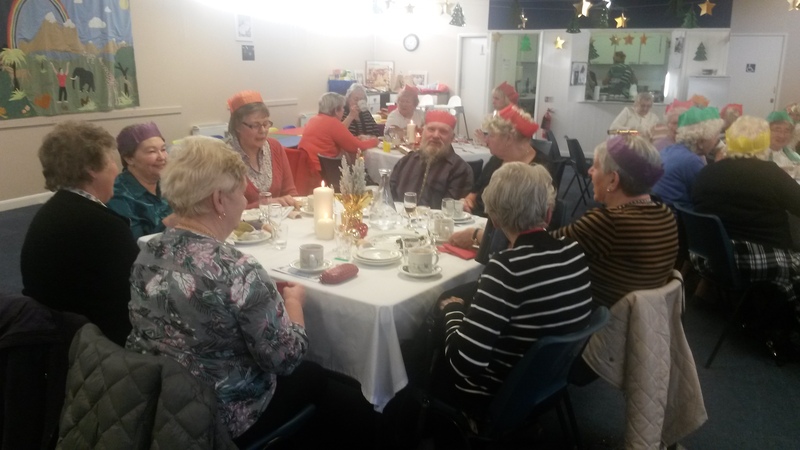 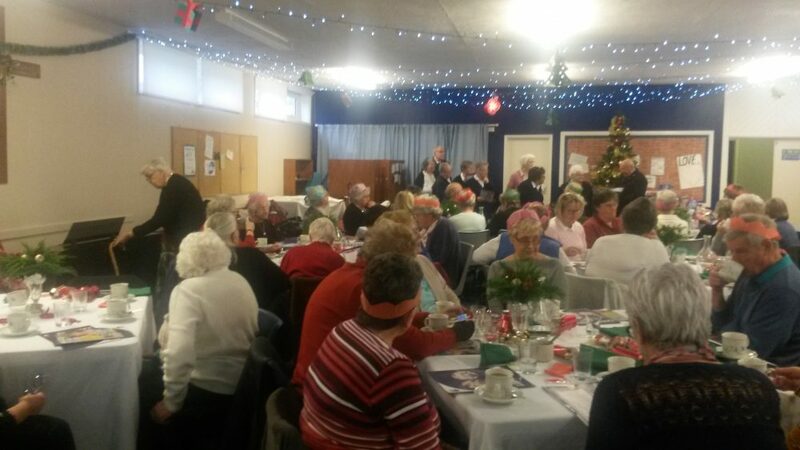 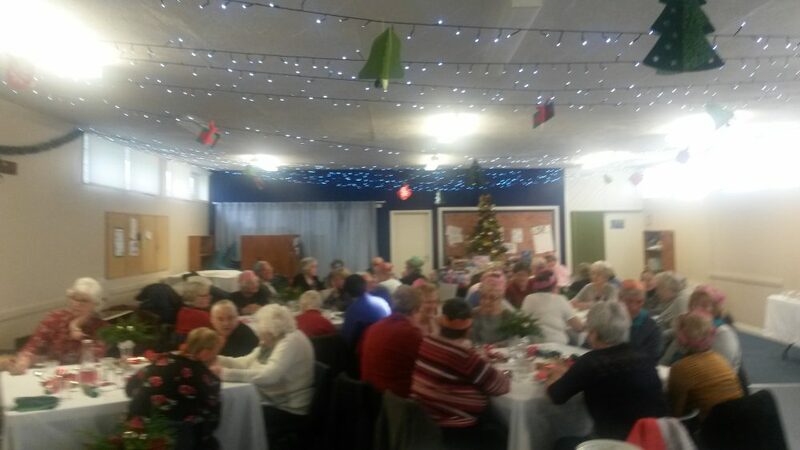 Over fifty people came to the Christmas lunch on Monday 4th December. 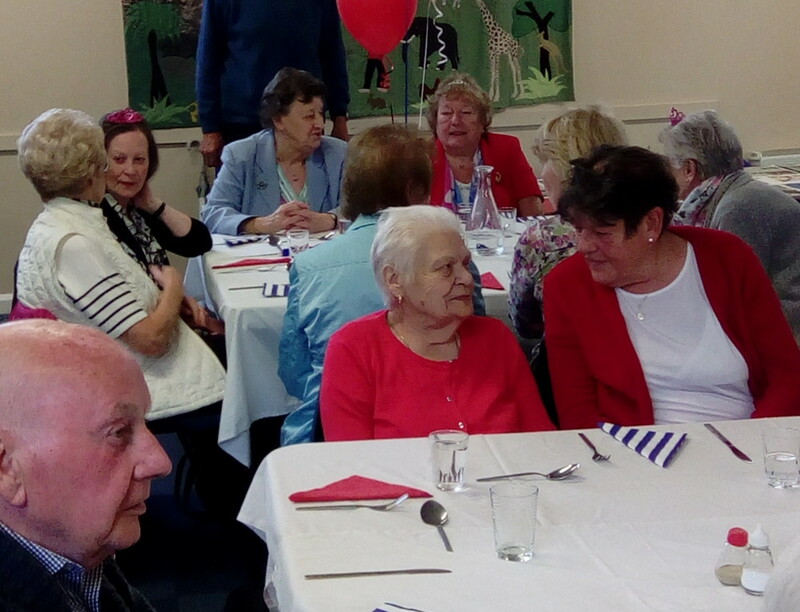 There were some new faces as well as regulars. 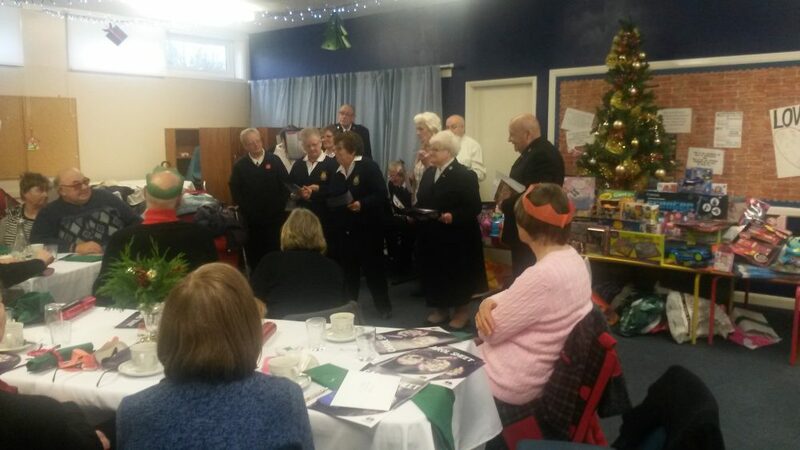 A group from the local Salvation Army came to lead us in singing favourite Christmas carols and to collect the toys that were donated in our annual Advent Toy Service. 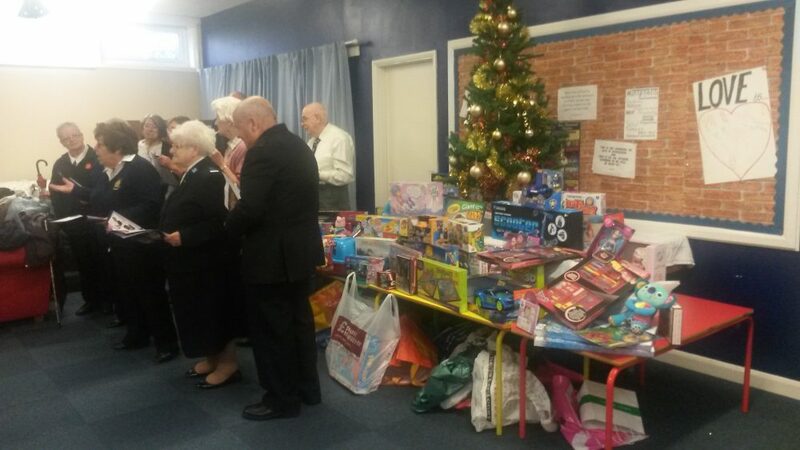 This year the toys will be going to local children who otherwise might not get presents this Christmas. 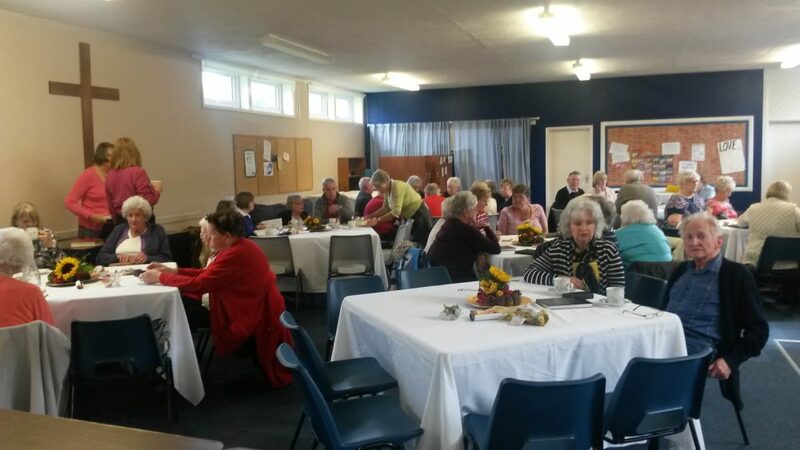 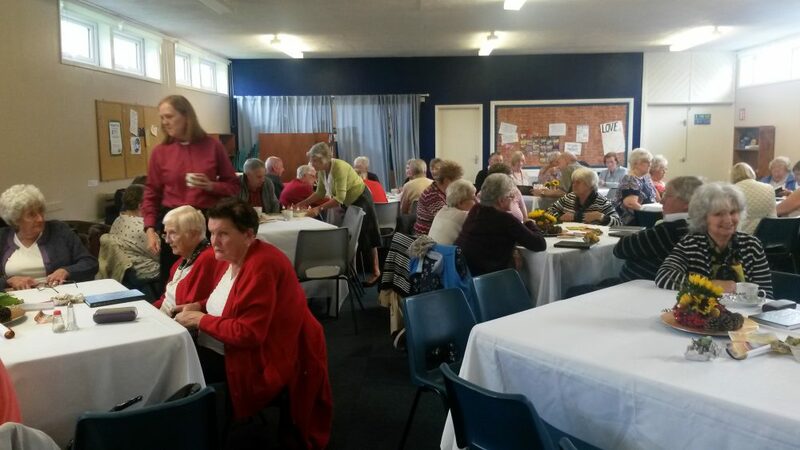 Fifty people came to the Harvest Lunch on Monday 25th September. 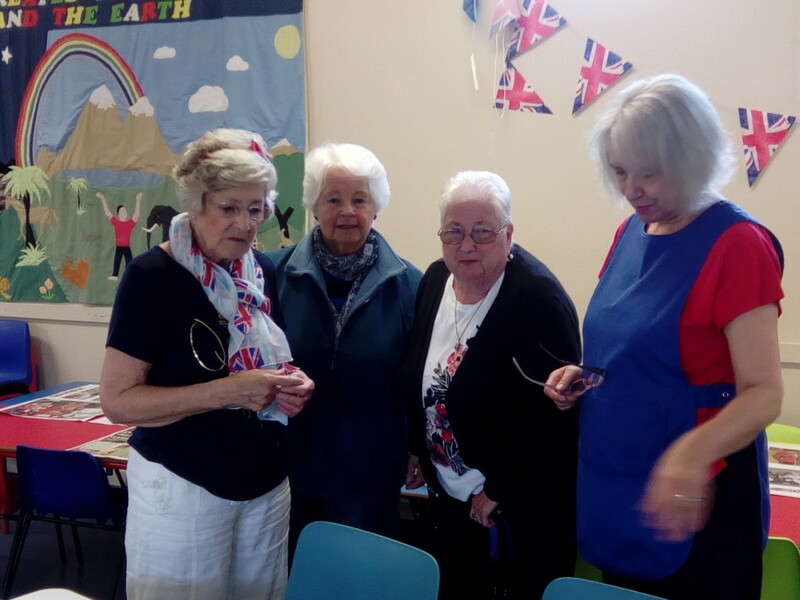 In spite of eight regulars being on holiday there were a few newcomers to swell the numbers. 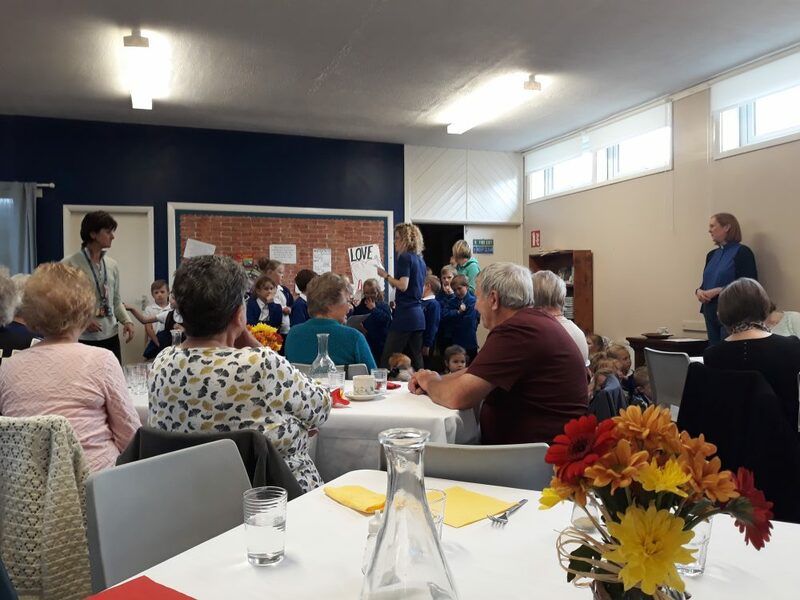 After a meal of harvest sausage pie, mashed potatoes and peas our new Curate Stella Greenwood gave a talk on harvest and thanksgiving. 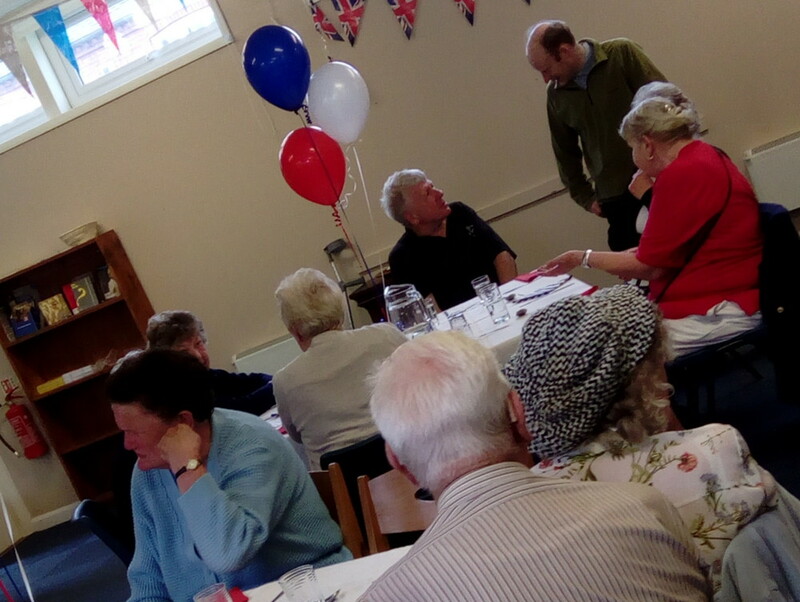 Then time for puddings – apple crumble, mixed fruit crumble, toffee apple cheesecake and mixed berry cheesecake. 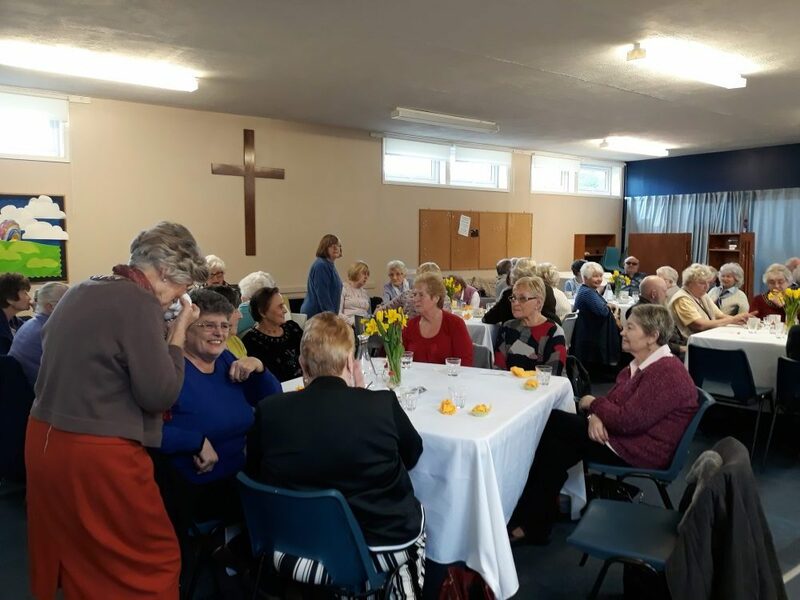 After the meal, when everyone had been served with tea or coffee, Sandra played the piano and we sang a couple of harvest hymns. 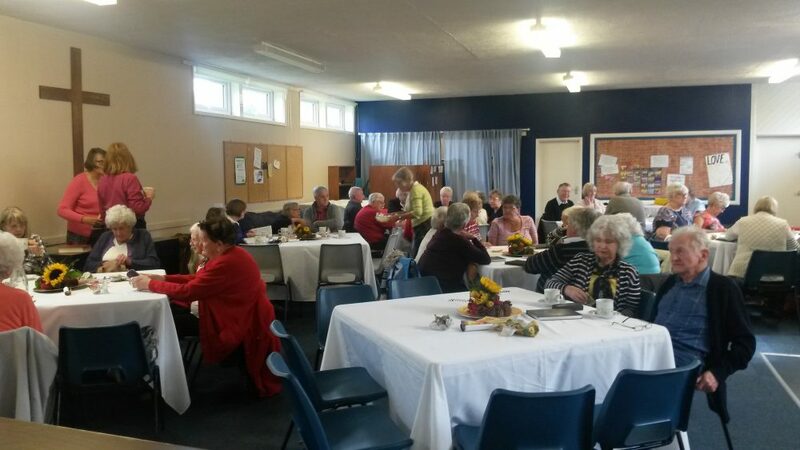 We invited our guests to join us for our Harvest Songs of Praise on Sunday 8th October. 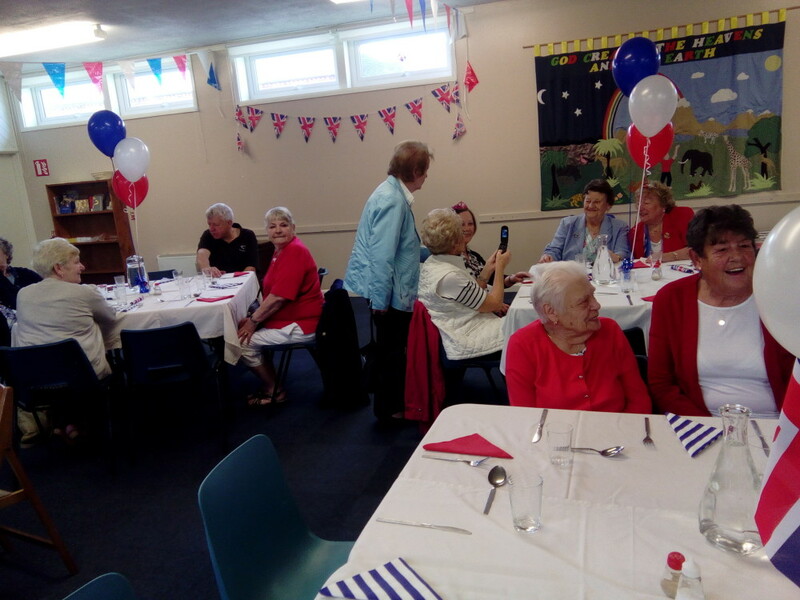 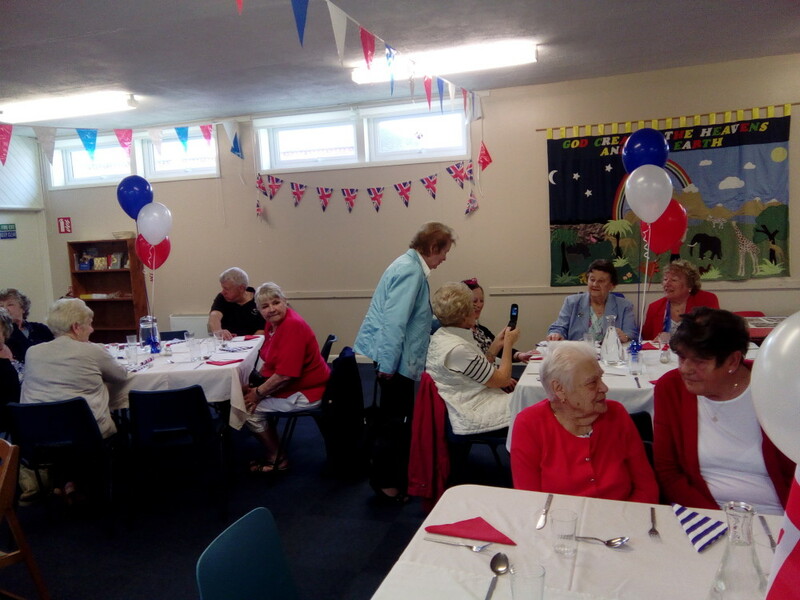 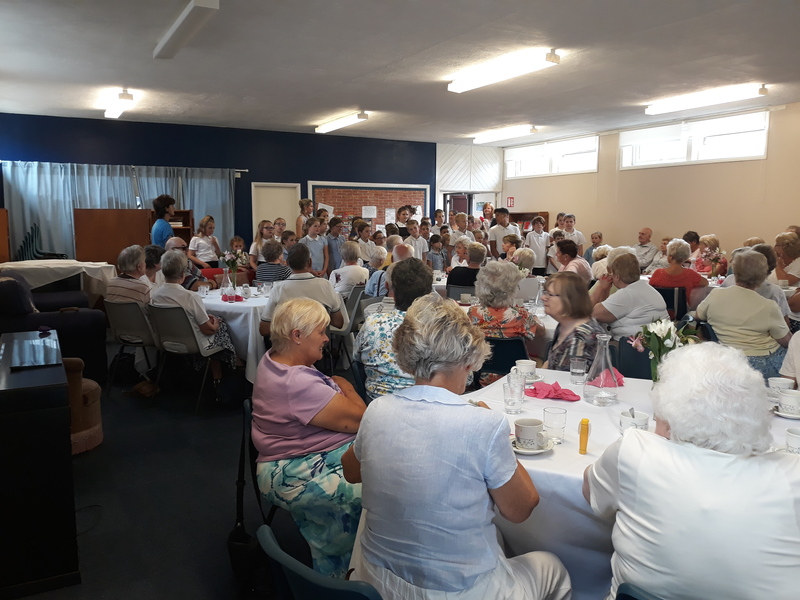 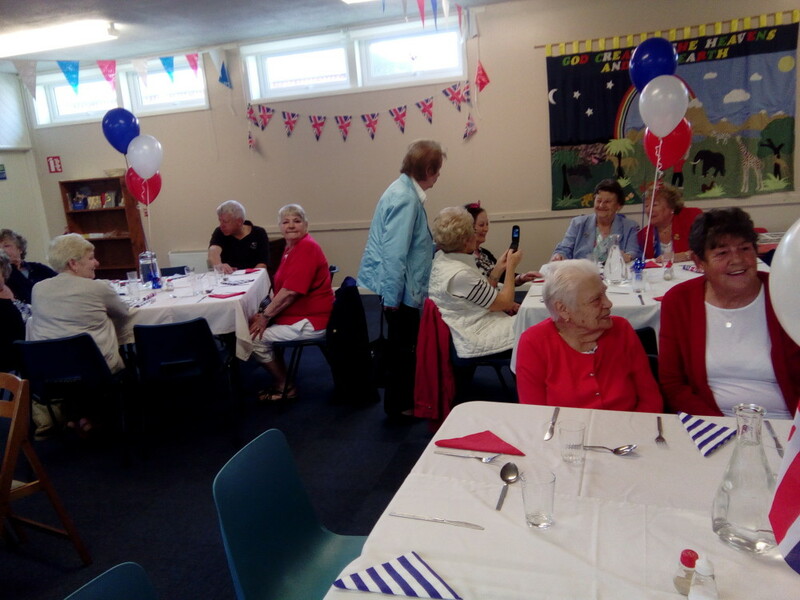 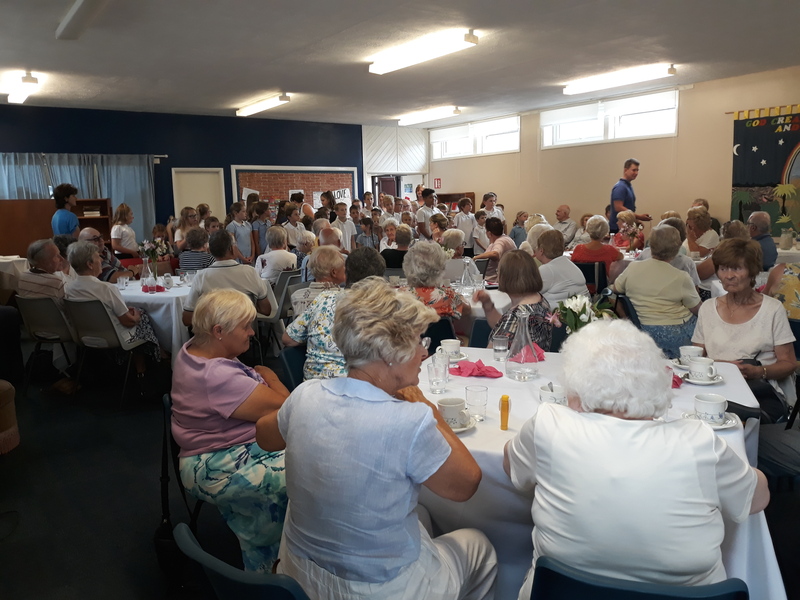 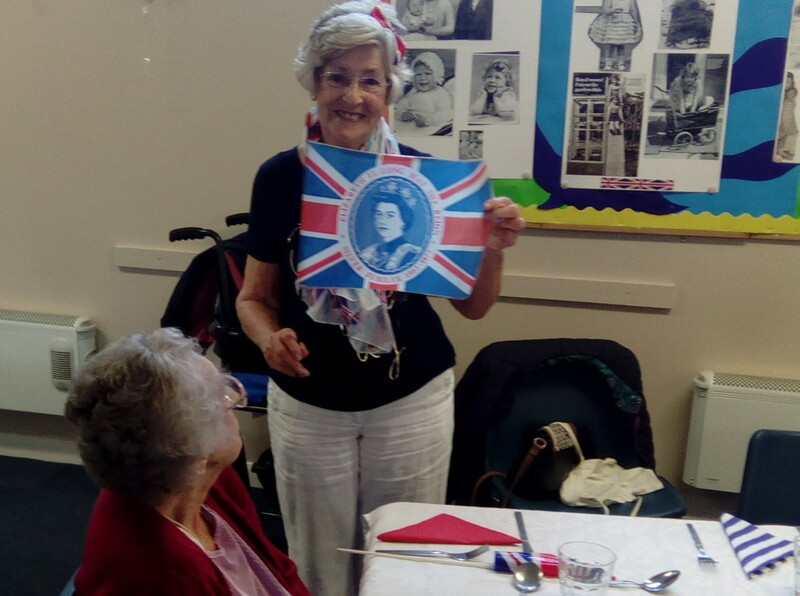 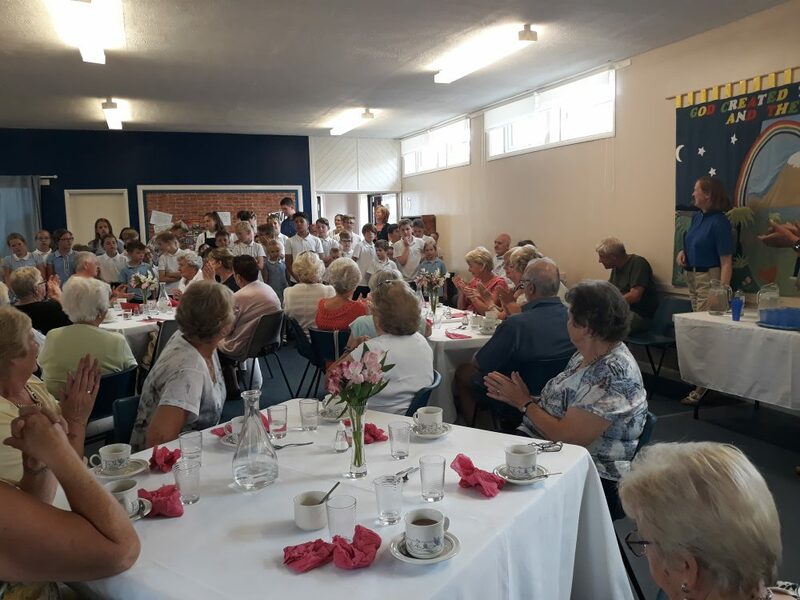 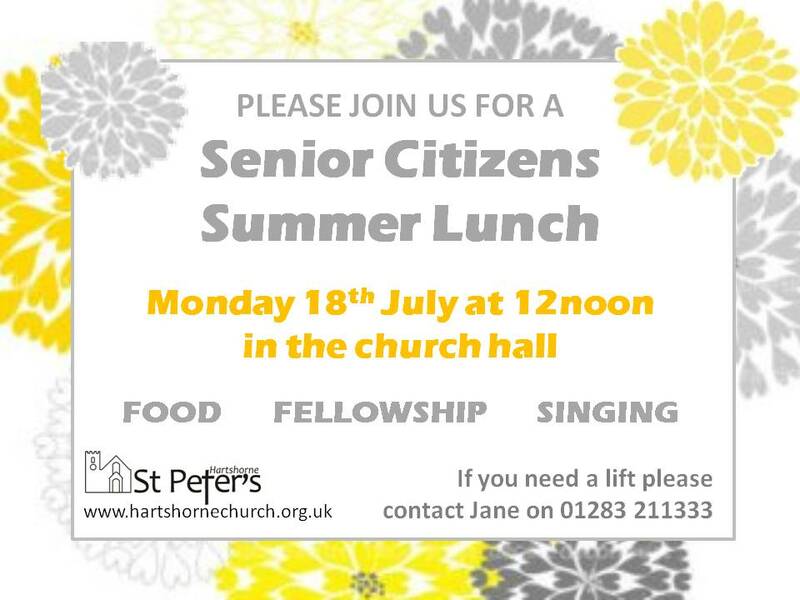 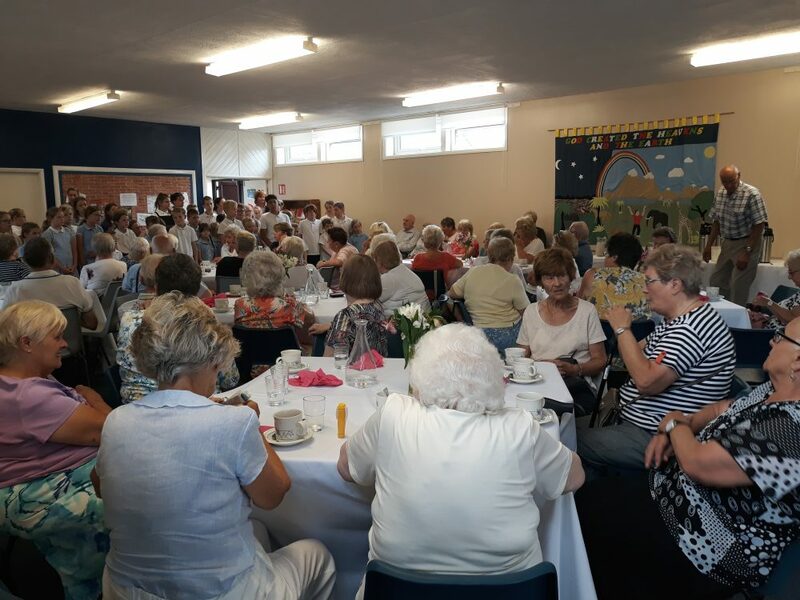 The Summer Lunch on 11th July was enjoyed by 47 people. 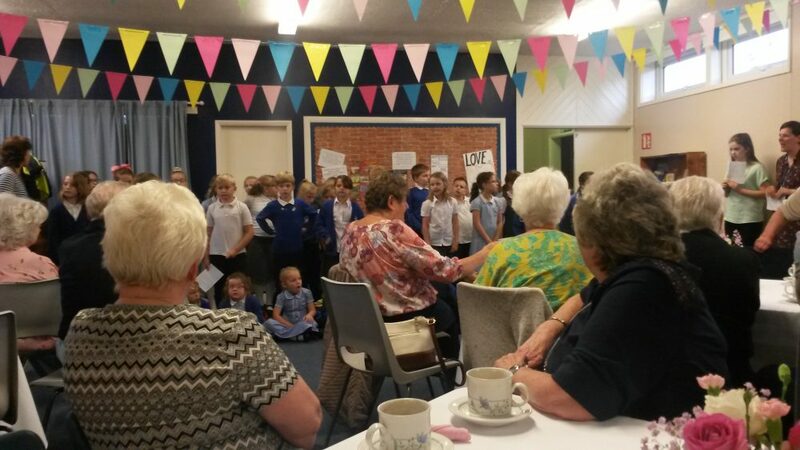 Children from Beech (reception) and Oak (years 3 & 4) classes from Hartshorne Primary School came to entertain us. 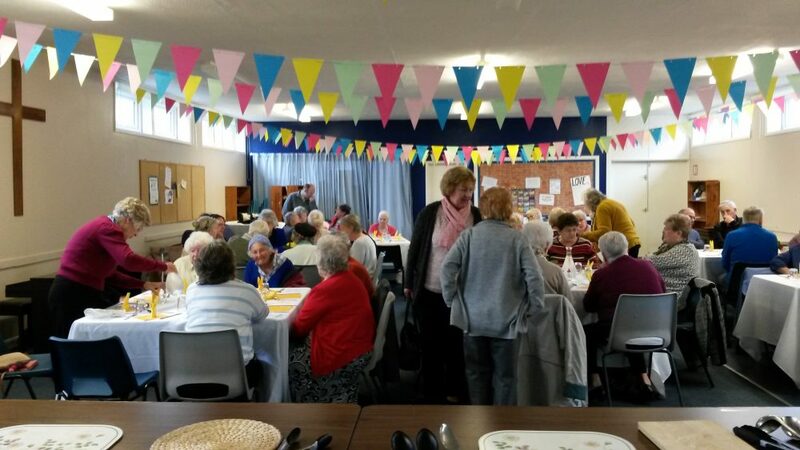 The Early Easter Lunch on 4th April 2017 was enjoyed by 60 people. 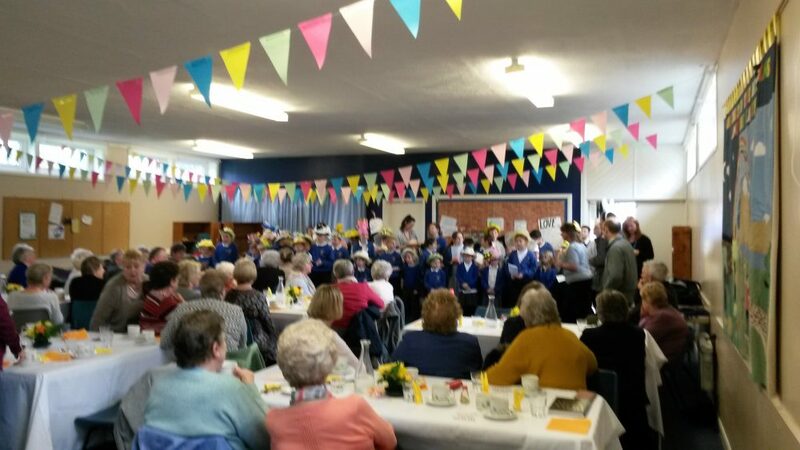 We were entertained by children from Hartshorne Primary School. 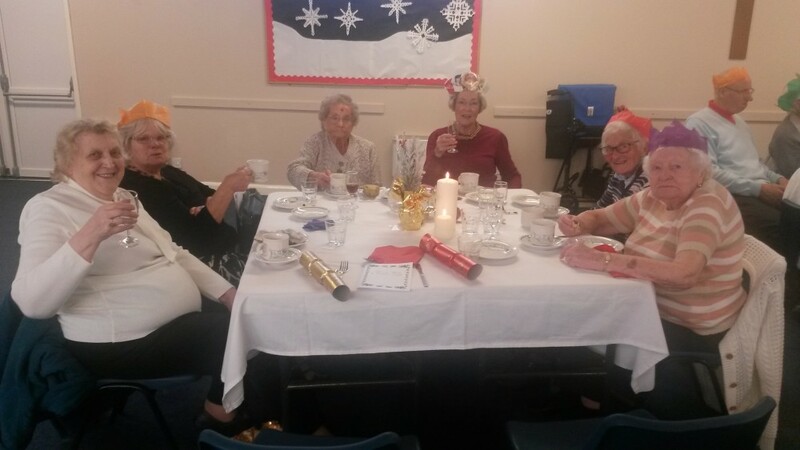 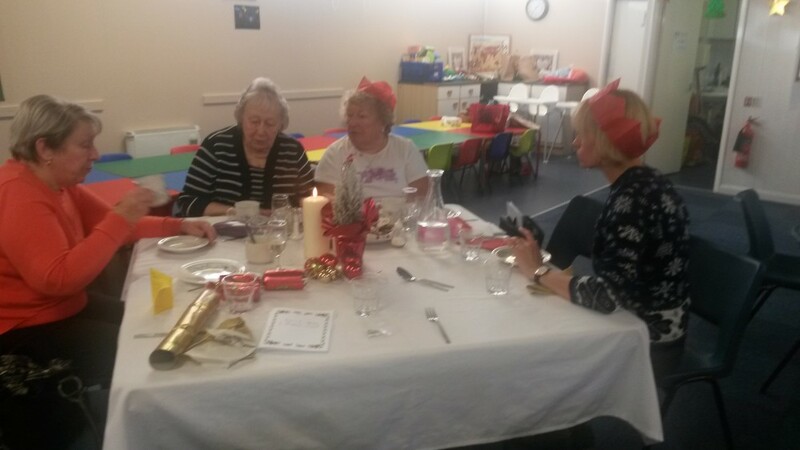 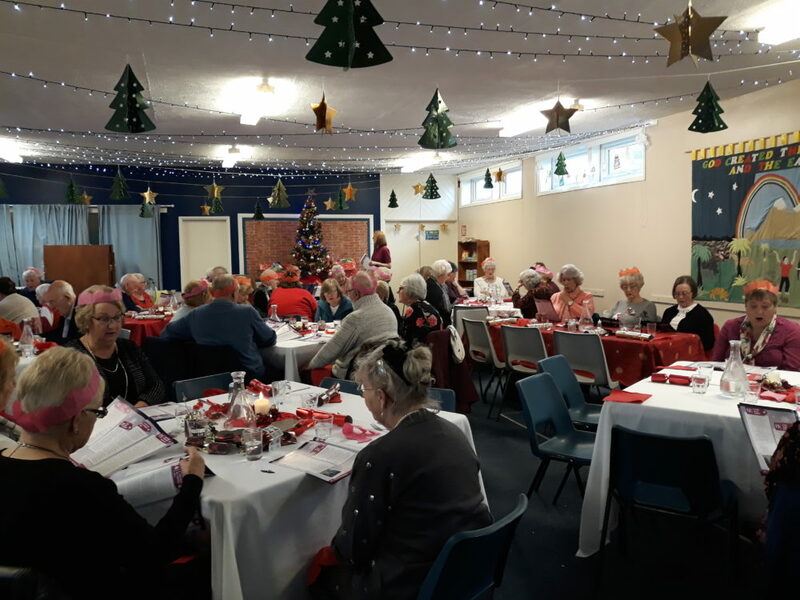 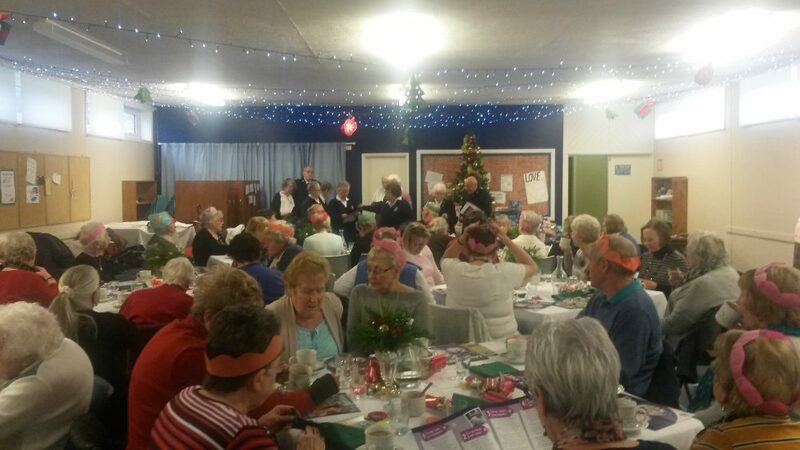 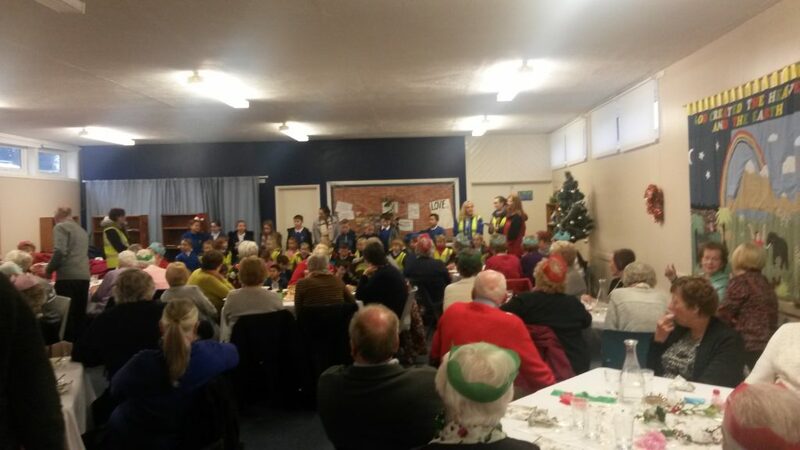 Christmas lunch on 6th December 2016 when over sixty people enjoyed a festive lunch followed by entertainment by children from Hartshorne Primary School. 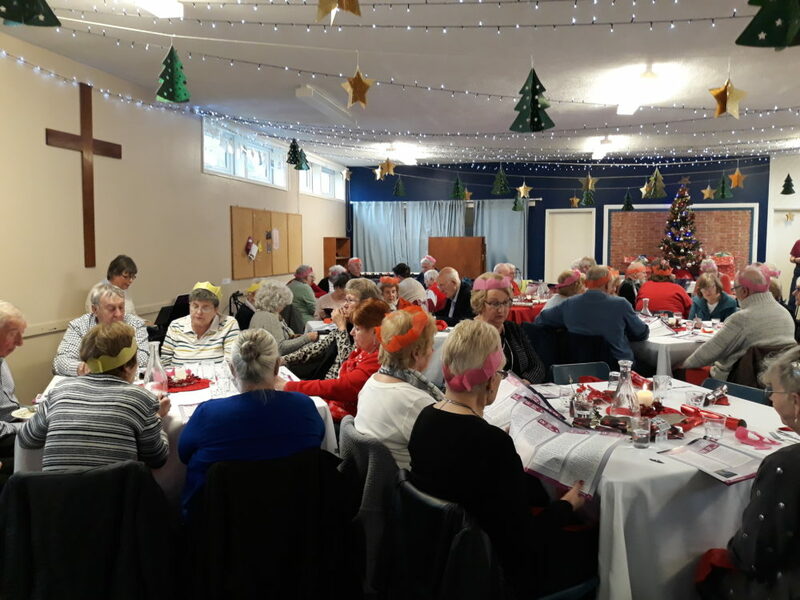 This year we held à Christmas Lunch on Tuesday 8th December which was attended by about 25 people and proved very popular. 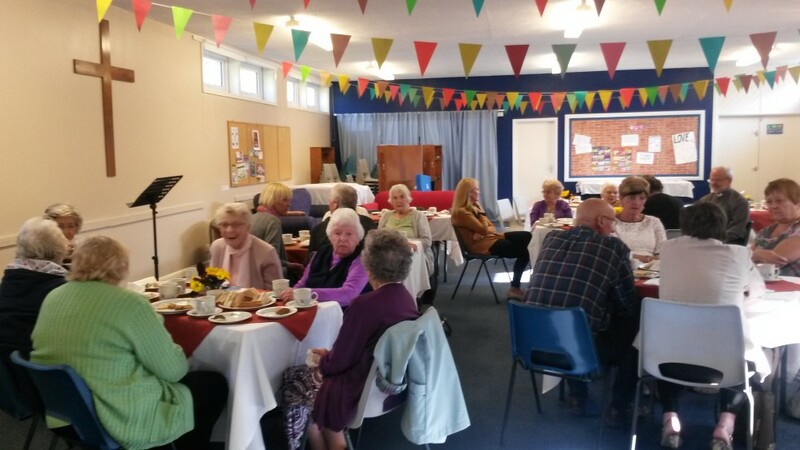 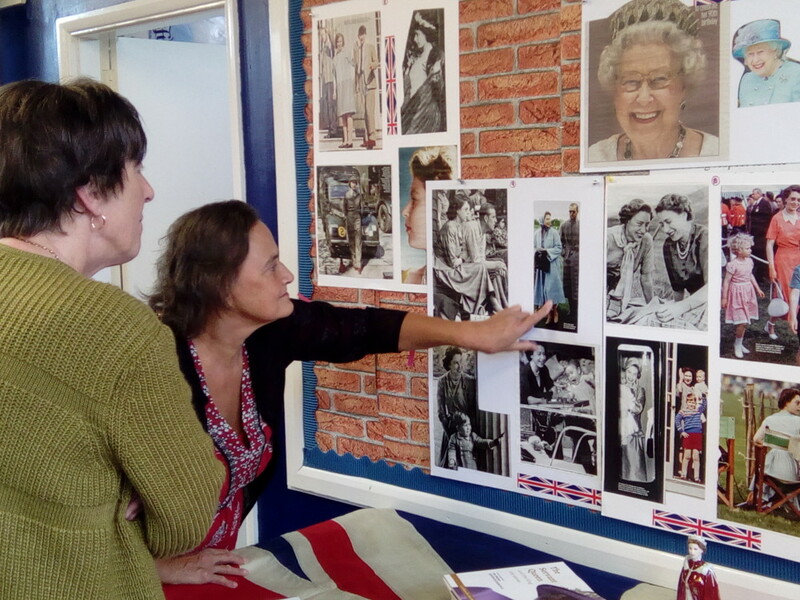 In October we held a Harvest Tea Party.